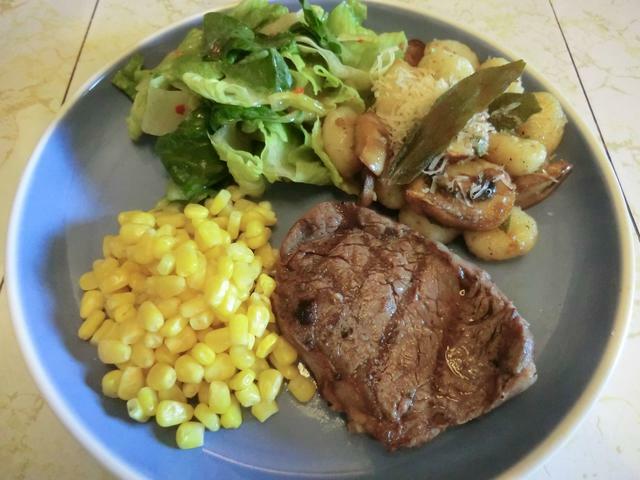 September | 2015 | Cooking is Fun … Really!! 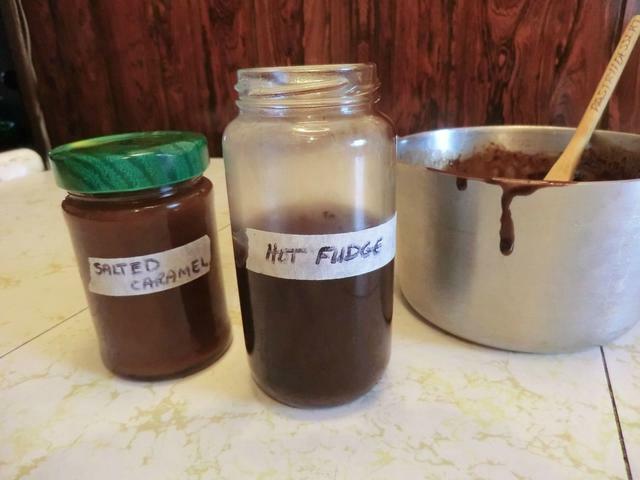 The recipe for this quick and easy hot fudge sauce was requested by someone who reads my blog. 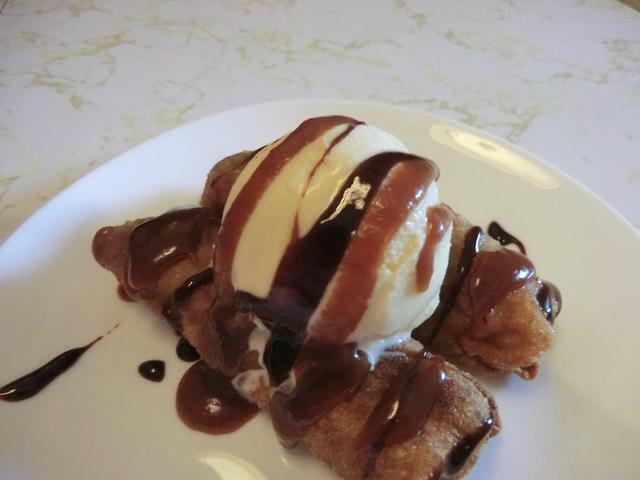 It was paired with a salted caramel sauce that I posted some time ago, drizzled over ice cream, and served with warm apple-raisin egg rolls. Over medium heat, heat together all the ingredients but the cocoa until the butter and sugar have melted. 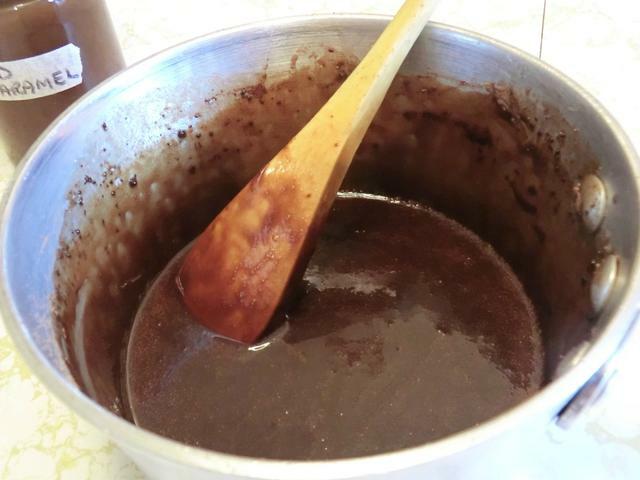 Add cocoa, stirring continuously and cooking for 2 minutes until sauce becomes smooth and thickens. Serve over ice cream or dessert of your choice. 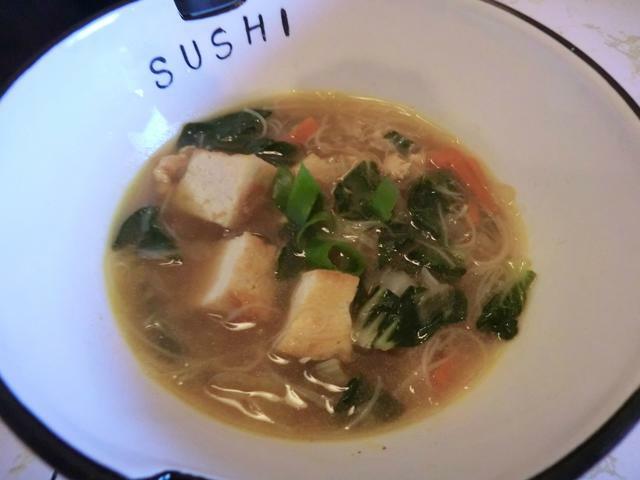 It’s fall time and the weather is perfect for coming in to the house to a comforting bowl of hot soup. Prepare the kale leaves by ripping them off the stems (freeze stems for future batches of vegetable stock) and cut into 1/2″ strips. Rinse well in 3 changes of fresh water draining after each one. Reserve. Using just the fat remaining in the pan, saute the onions and garlic until the onions are soft and translucent and just beginning to get browned. Add the stock, cooked sausage meat, diced potatoes and about 1/2 tsp salt and 1/4 tsp ground black pepper. (You may add the dried herbs at this point as well, if using.) Cover and bring the soup to a simmer. You can add another cup or so of water to make sure that your potatoes are covered. 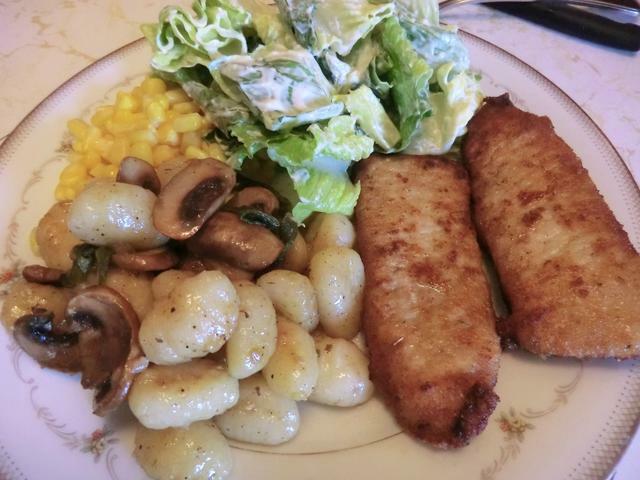 Cook for about 10-12 minutes until the potatoes are just tender. Add the kale, cover, and cook for another 2-3 minutes until the kale is wilted. 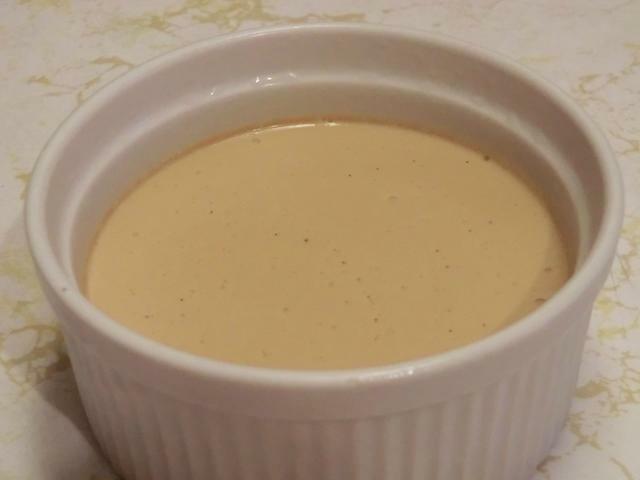 Stir in the whipping cream and bring to a low simmer. Taste again for seasoning and add more salt and pepper if desired. 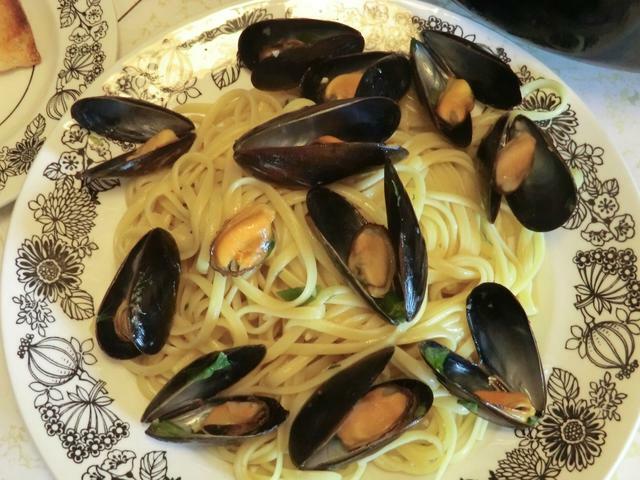 Serve piping hot with toasted garlic bread. 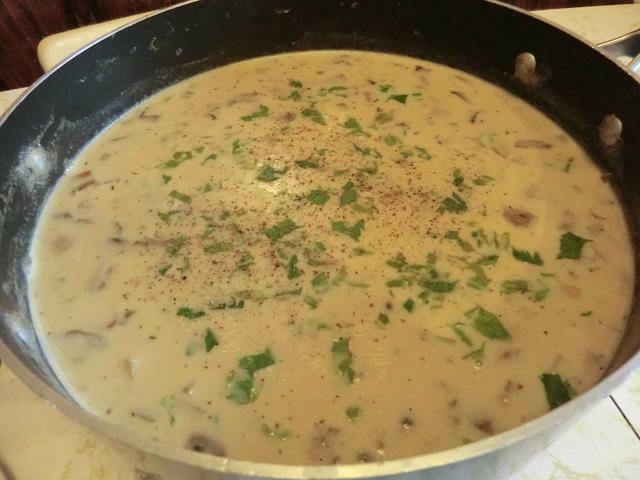 I love clam chowder and cream of mushroom soup. 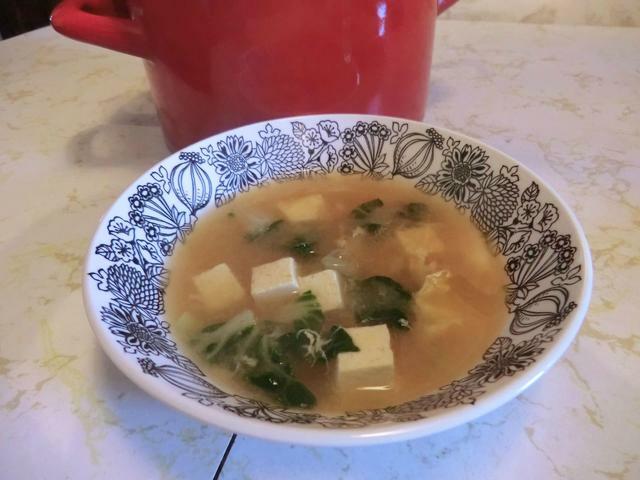 This soup is a combination of the two. 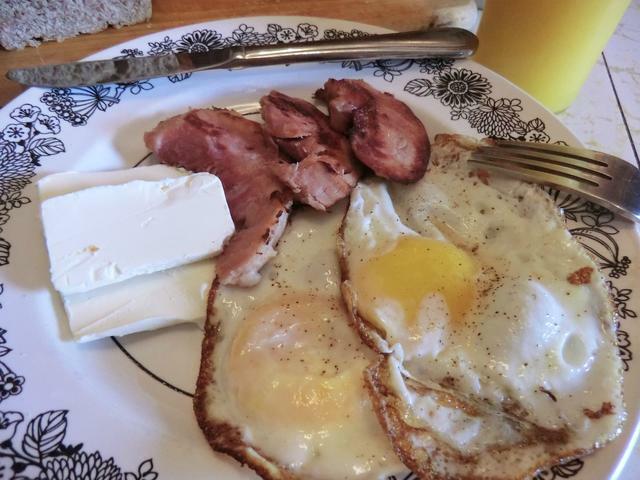 I tried to make it a bit healthier than the recipe that inspired it as 4 CUPS of half and half seemed a tad excessive. 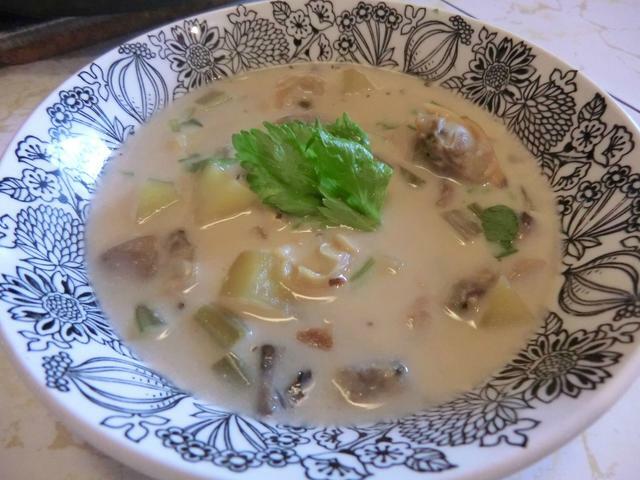 And here’s the result … a Clam and Mushroom Chowder. If you wish, cook up 6 strips of bacon until crispy in a large saute pan over medium high heat. 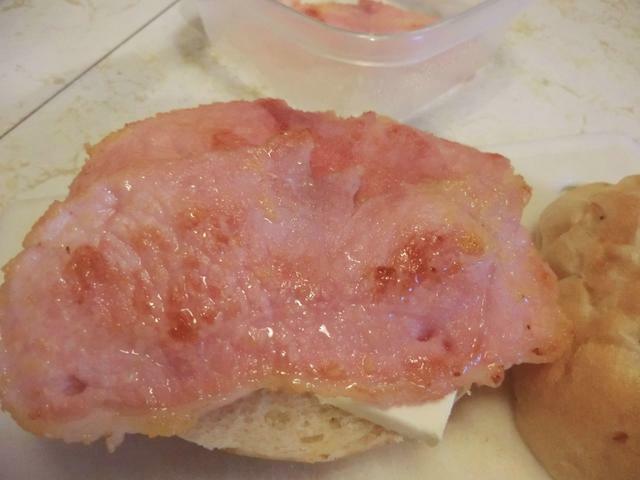 Remove the bacon strips to a plate lined with paper towels and allow to cool. Chop up roughly. Reserve 2 tsp of the bacon fat in the saute pan to fry the vegetables for the soup, or use olive oil and butter. Add onions to the bacon fat and saute until translucent. Add minced garlic and saute for a minute or two until it starts getting some colour. Add mushrooms and celery. Saute for another 5 minutes or until most of the liquid has evaporated from the mushrooms and they’re starting to get golden brown. Add diced potatoes, stock, salt, pepper and dried thyme. If needed, add water until the vegetables are covered by about 1/2 an inch. Bring to the boil and then cover and simmer for 15 minutes or until the potatoes are tender when pierced by a fork. 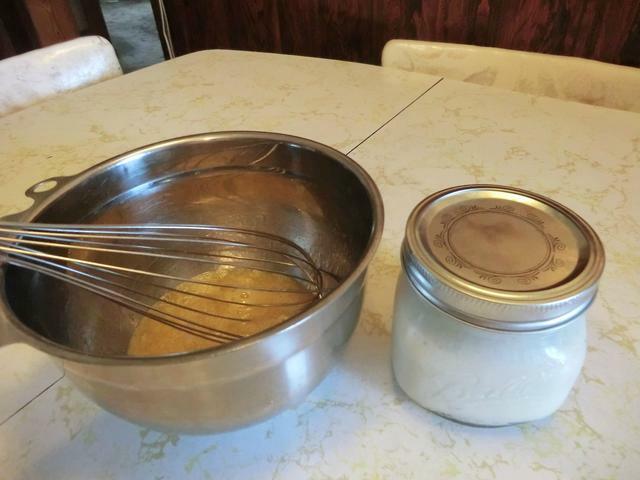 Put the whipping cream and the flour in a jar. Shake to dissolve the flour. Add to the saute pan, stir through and cook until soup mixture has thickened a bit. Add the frozen clams. 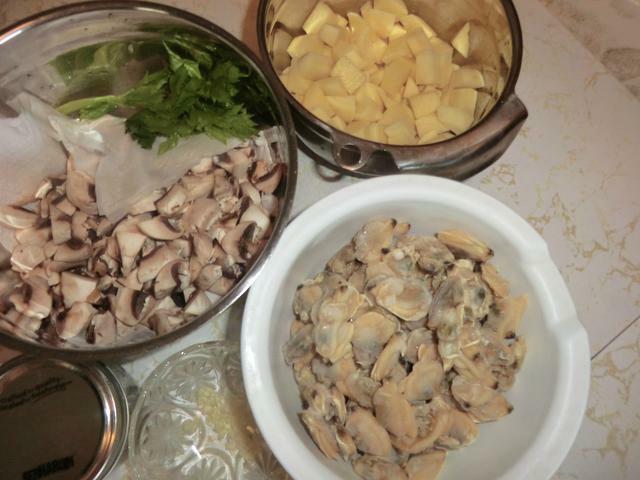 Bring the mixture to a simmer and cook for 5-10 minutes until clams heat through and the flavors blend. 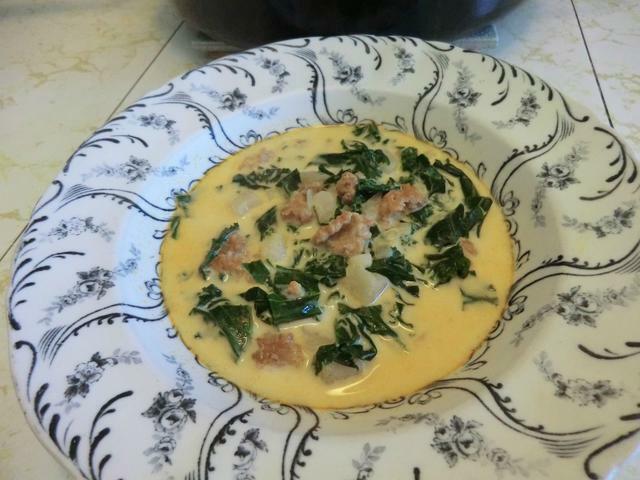 Serve into individual bowls and garnish with chopped bacon or julienned celery leaves. And, while I’m on a roll, a completely different, RED soup. 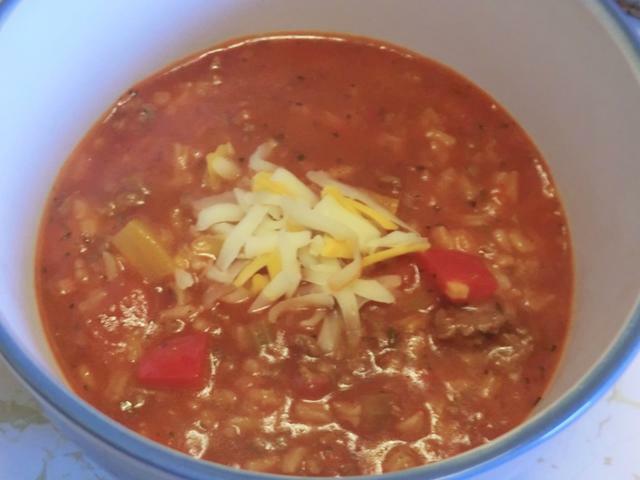 This Stuffed Pepper Soup has all the ingredients of a stuffed pepper but in soup form. In a large pot heat 1 tbsp of olive oil over medium heat. Once hot add the beef to the pot and season with salt and pepper. Cook, stirring occasionally while breaking up beef, until browned. Drain beef and pour onto a plate lined with paper towels, set aside. 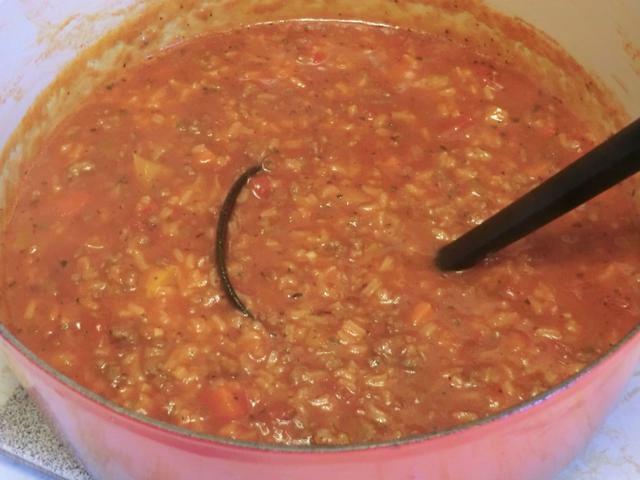 While soup simmers, prepare rice according to directions listed on package, then once soup is done simmering stir in desired amount of cooked rice into soup*. 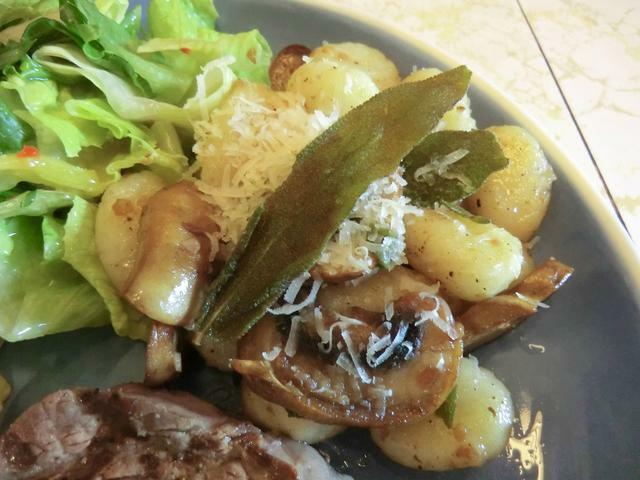 Serve warm topped with optional cheese and garnish with fresh parsley. 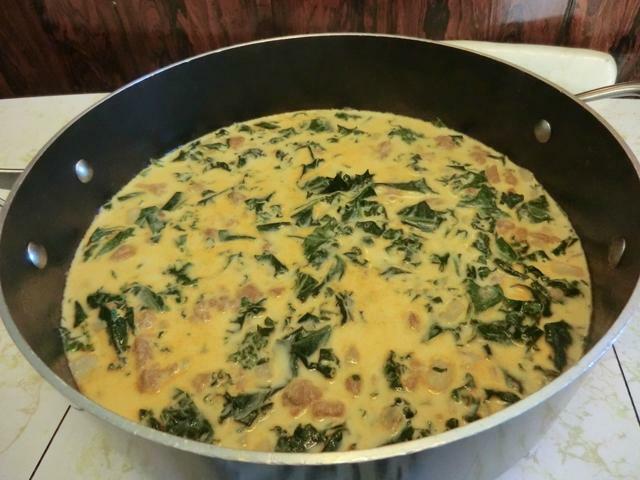 *For a thinner soup don’t add all of the rice and for a thicker heartier soup add it all. 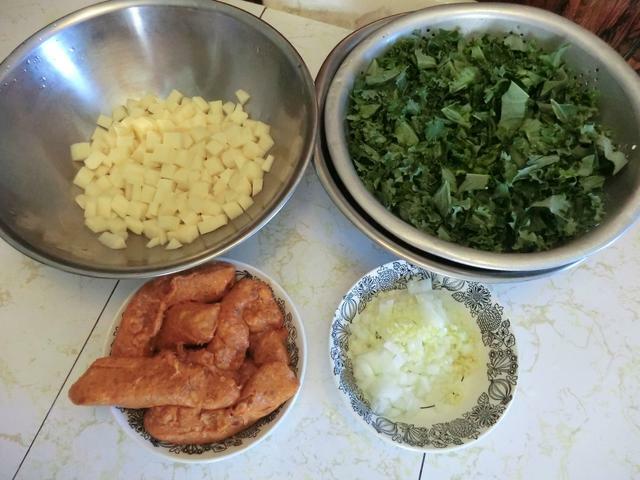 Also, if you plan on having it for leftovers the next day then don’t add the rice to the pot of soup, just add it to each individual bowl, then reserve the rice in a separate container in refrigerator to add to the soup the next day. NOTE: I used red and yellow peppers cause that’s what I had, and a beef bouillon cube instead of the broth. I added 2/3 cups of uncooked rice with the peppers and simmered it all together for 30 minutes. I’ve invested a lot of time in this sourdough starter and my bulldog nature refuses to scrap it even if my starter-only bread attempts have been a failure. So I have incorporated some of the starter into my basic bread/pizza recipe. 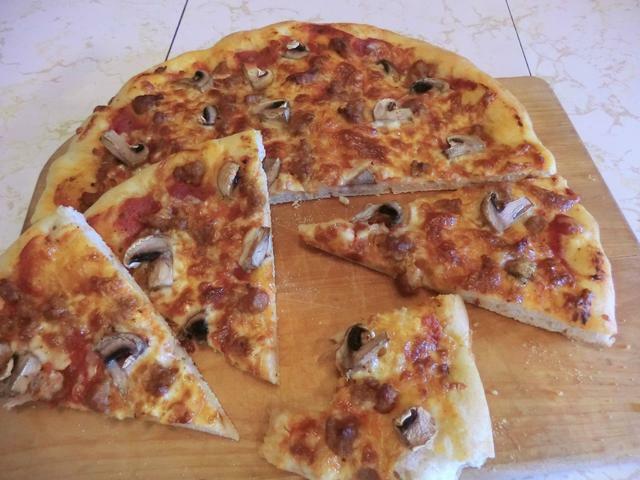 The result … a great pizza dough with the rise of dry active yeast and the flavour of sourdough starter. I’m calling the resulting recipe, “Frankenstein” Pizza Dough. 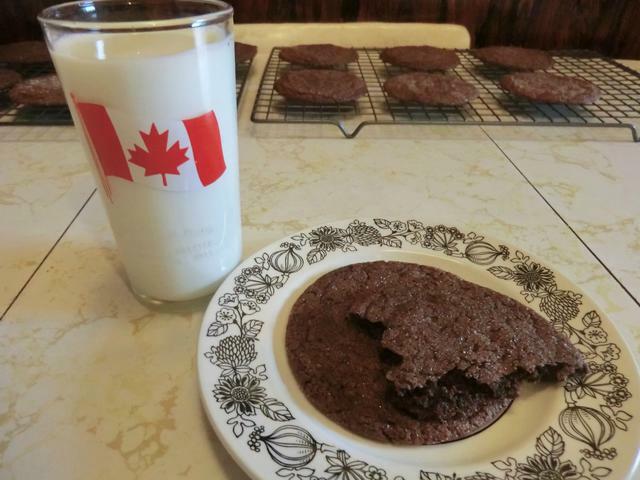 I have some whole wheat flour in my fridge and decided to see if I could include SOME of it into this recipe. 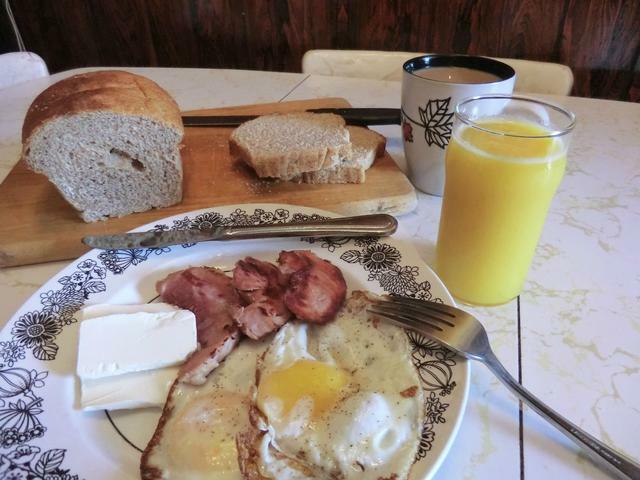 I started by turning my all purpose flour sourdough starter into a whole wheat one by feeding it with whole wheat. And then I added some more whole wheat flour to the pizza dough. 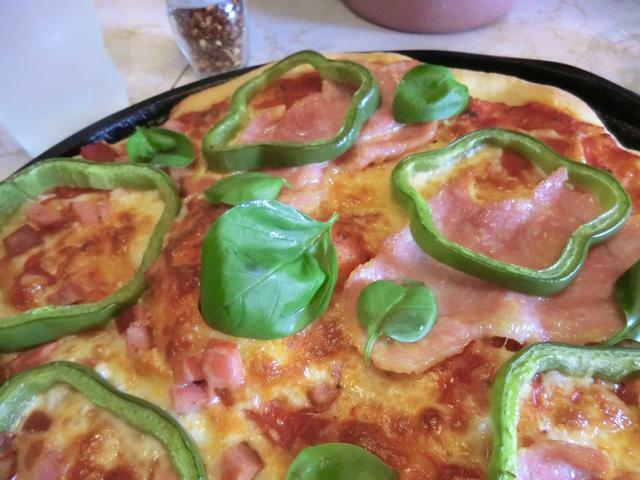 The result is a very tasty and marginally healthier pizza, if pizza can ever be considered healthy with all that cheese. 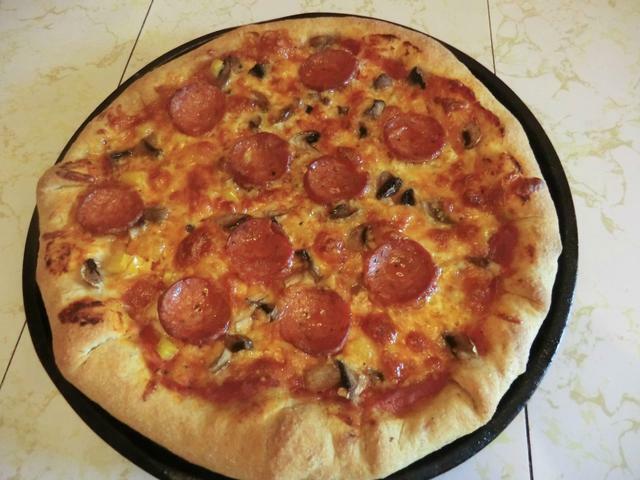 Speaking of cheese … I made a stuffed crust pizza. 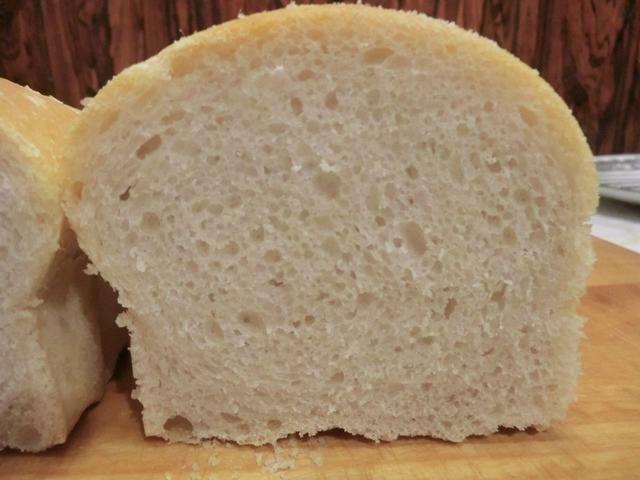 ** For the whole wheat version: Replace 1 cup of all purpose flour with whole wheat flour. In a medium sized bowl, add the warm water and stir in the sugar. Sprinkle the yeast over the water. You can stir it in at this point, as well, if you like. Let it sit for 5-10 minutes until the mixture becomes foamy. In a large bowl, add 2 cups of flour (1 cup all purpose and 1 cup whole wheat in the variation) and the salt. Stir to mix in the salt evenly. 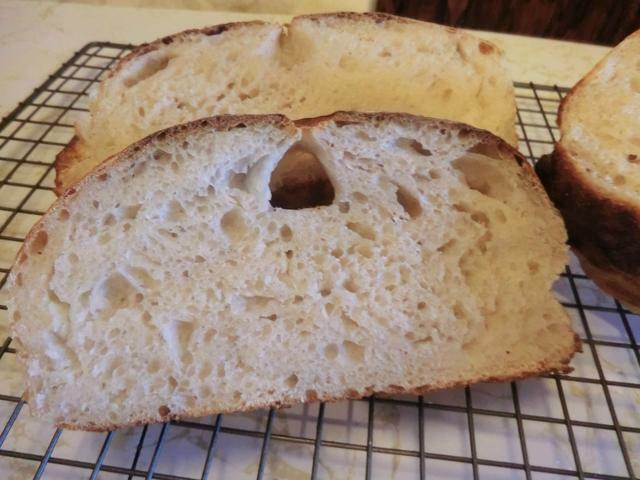 Pour the proofed yeast mixture and the sourdough starter into the bowl with the flour and stir well with a large wooden spoon until you have a nice smooth batter. Beat for a few minutes. Stir in the flour, 1/4 cup at a time, until you can no longer stir the mixture and it has pulled away from the sides of the bowl into a ball. On a clean work surface, large enough for kneading comfortably, spread 1/4 cup of your remaining flour. Dump the loose batter on top of the flour and gradually knead in the flour on your work surface. Knead in the remaining flour in your bowl. 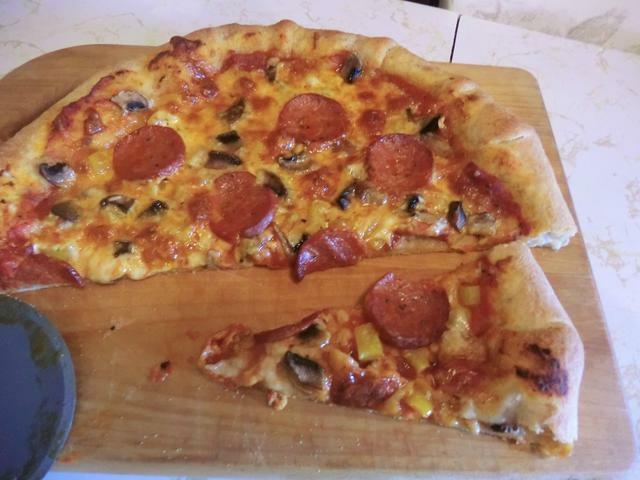 This will take anywhere from 5-10 minutes and you’ll end up with a soft dough that’s still a bit tacky but won’t stick to your hands when you touch it. 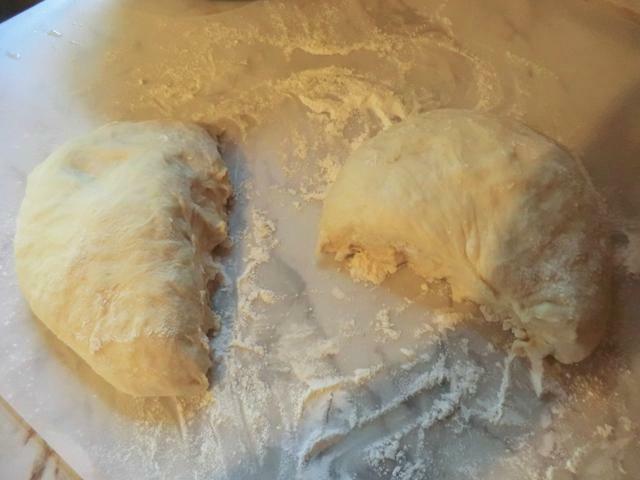 Divide the dough into 3 equal portions. 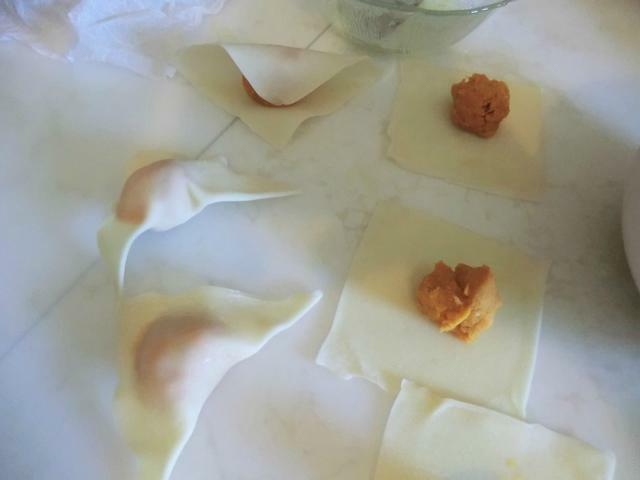 Shape each portion into a ball, rub the surface lightly with vegetable oil and place inside a clean medium freezer bag. Seal the bag and freeze the dough until needed. Remove the frozen dough from the freezer the night before you wish to use it (after supper is perfect) and put it in the fridge to thaw. 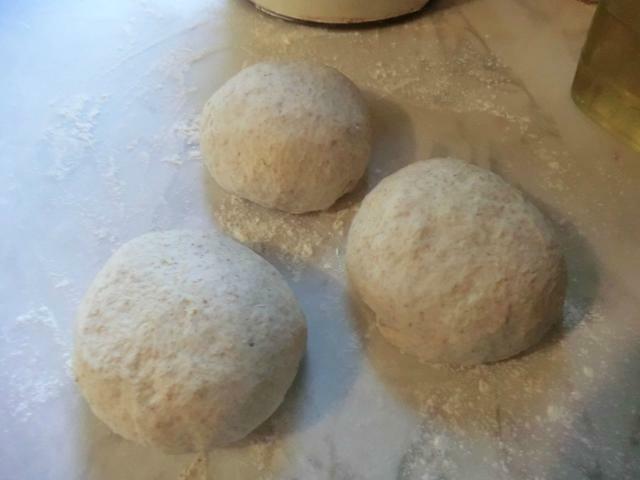 The next day, or even the day after that, remove the dough from the freezer bag and gently stretch into a circle on a lightly floured surface. 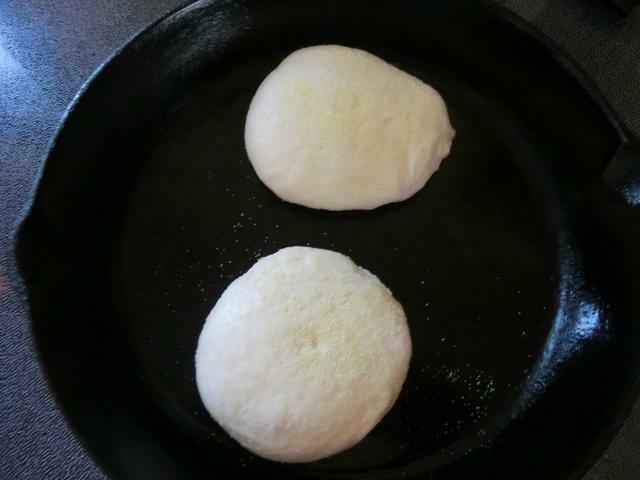 Sprinkle your baking sheet with cornmeal and transfer the stretched dough circle to the middle of the pan. Stretch further if needed to fill the pan. 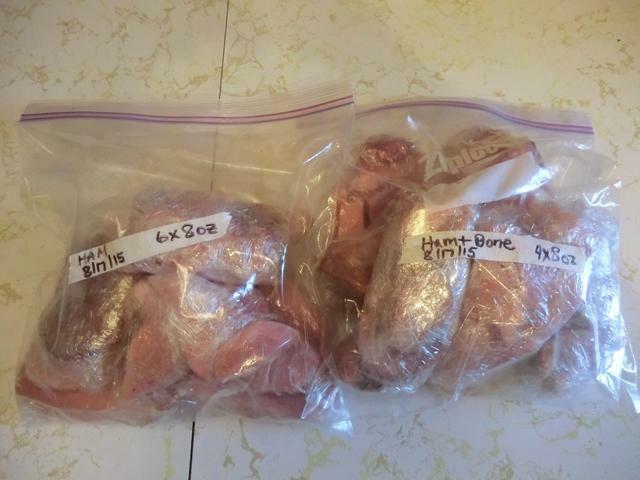 Cover and let come to room temperature … about an hour. Preheat the oven to 425 deg Fahrenheit. 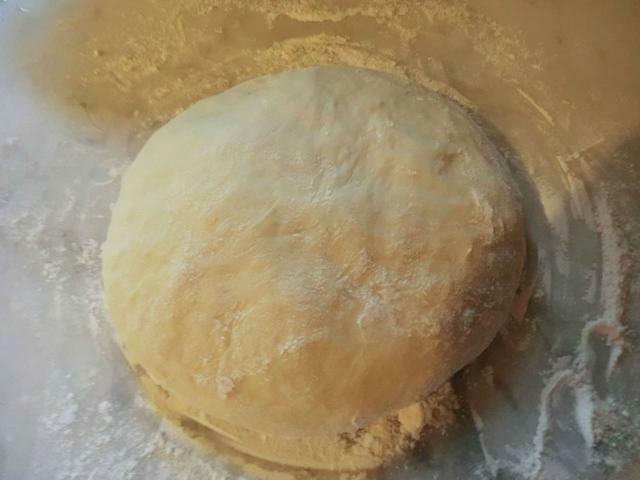 Brush some extra virgin olive oil around the edge of the dough, about an inch in width. 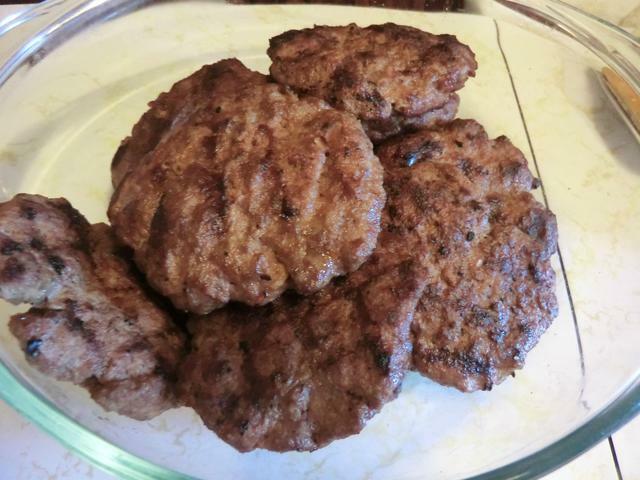 Top as desired and bake in the preheated oven for 20-23 minutes. 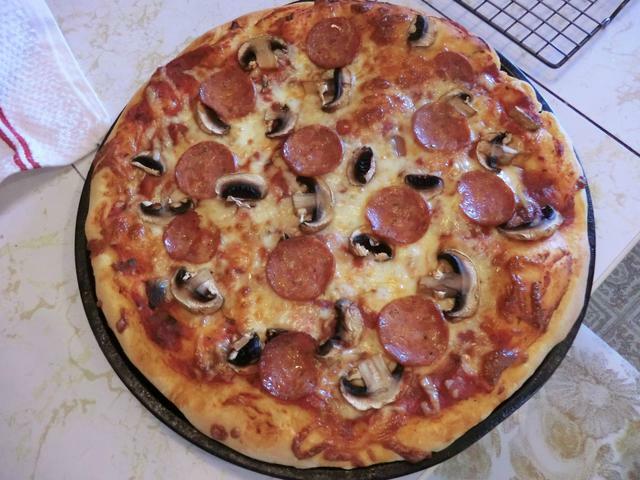 For the stuffed crust – roll out the dough about 1-2 inches larger in diameter than the pizza pan. 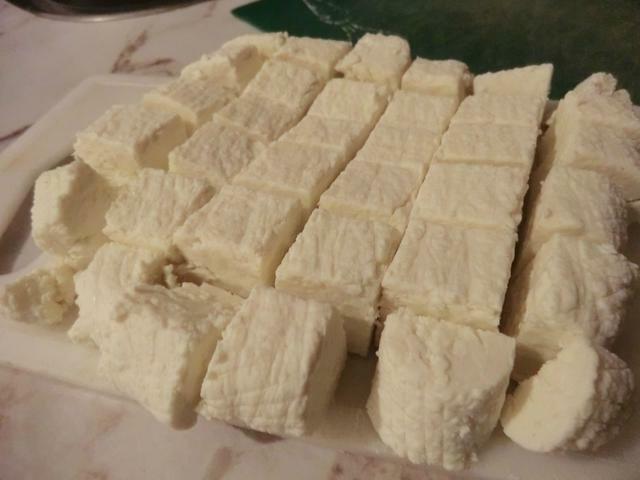 Cut cheese into 1/2 inch thick and 1/2 inch wide sticks and arrange around the edge of the pan. 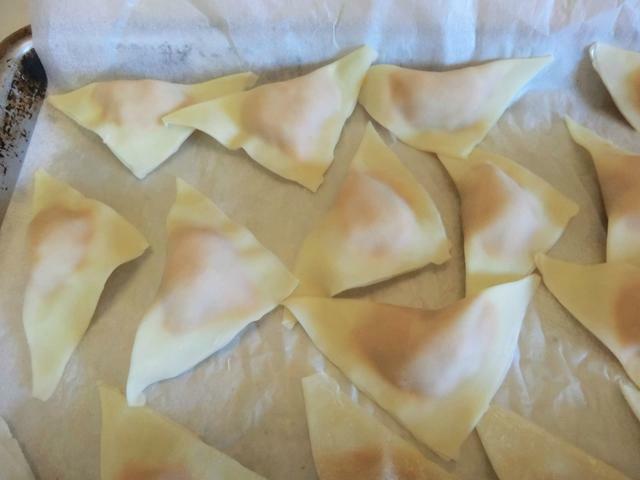 Fold over the excess dough and seal well so that the melted cheese won’t leak out. 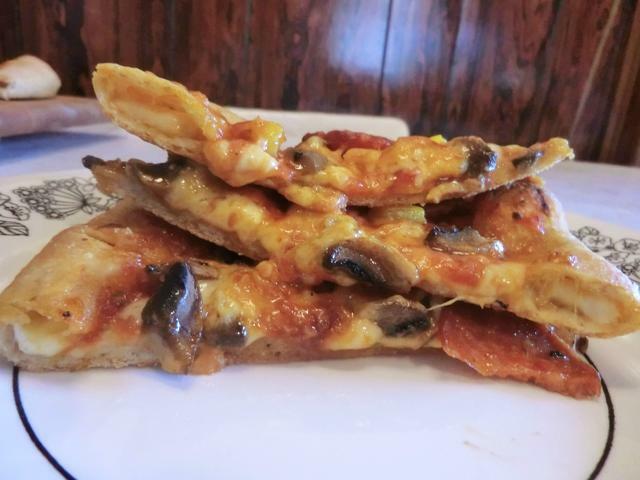 For this pizza, I alternated cheddar and mozzarella cheese. 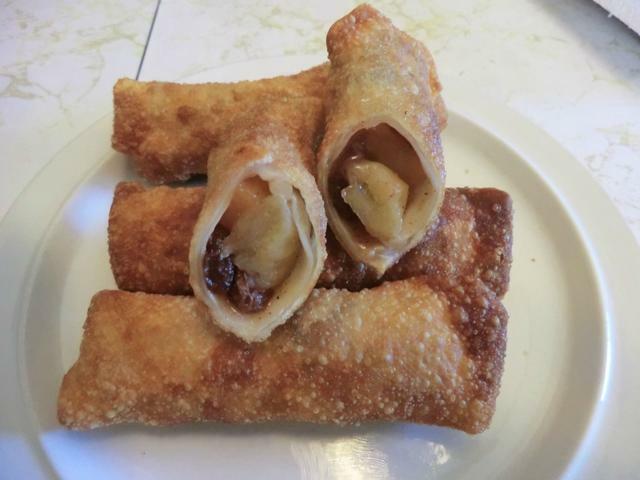 I love egg rolls but haven’t ever made any myself until this past weekend when I brought home a package of wrappers and enough inspiration to try both a sweet and savoury filling. 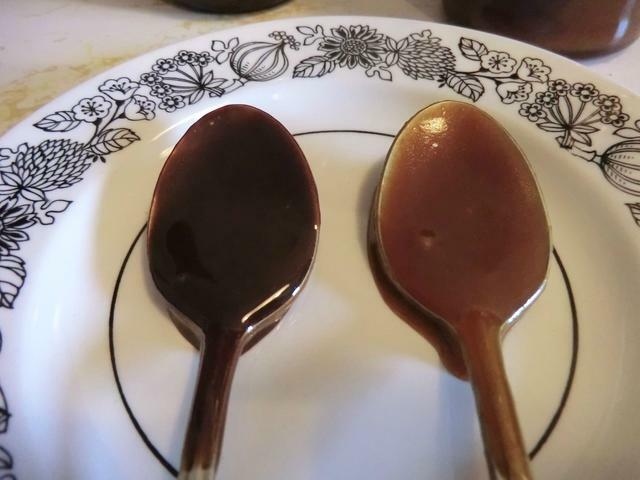 For the sweet filling, I made up a batch of cinnamon-apple caramel syrup which I’d showed in the July roundup and used to fill wonton cups and as a topping for pancakes. 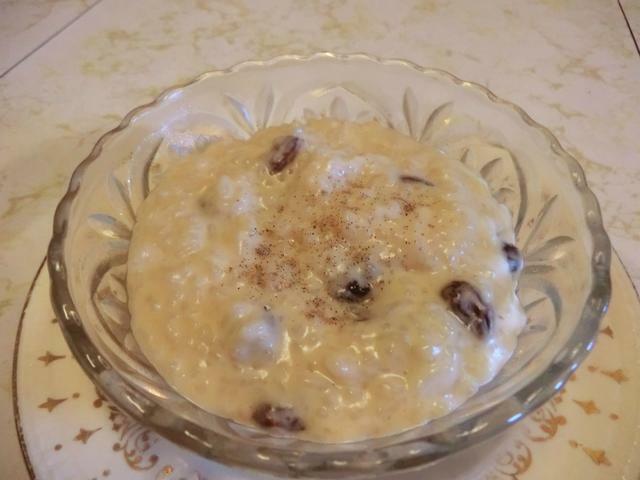 I didn’t post the recipe then so I’m including it below, with the addition of 1/2 cup of raisins for added flavour. 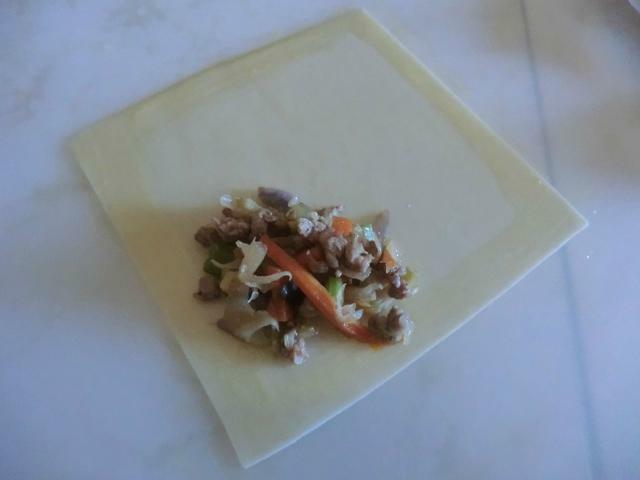 If using this filling in egg rolls, drain off any excess liquid, as you want a dry-ish mixture so your wrappers won’t get soggy. Peel, then quarter the apples. Cut out the core and cut each quarter into 3 or 4 chunks or slices, depending on what you’re going to use it for. Mix the cornstarch and water together in a small bowl. Place the remaining ingredients into a saucepan along with the apple slices and cornstarch mixture. 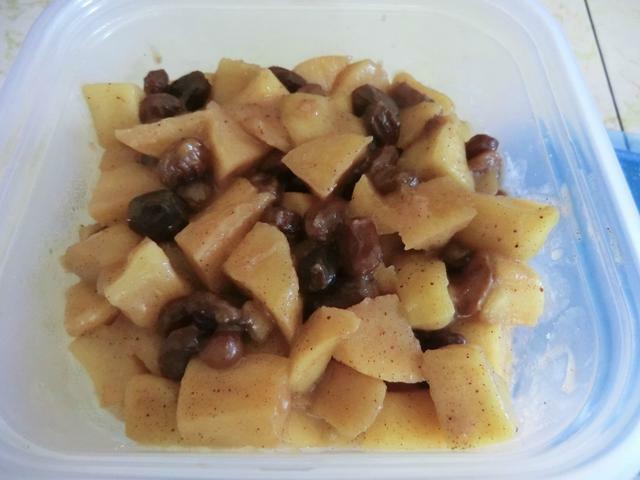 Cook over medium heat, stirring occasionally, for 8 to 10 minutes or until the apple is tender (but not mushy) and the sauce has thickened to a syrup consistency. Depending on the amount of juice in your apples, you may need to add a splash of water to get the syrup to your desired consistency. When ready, set aside and keep warm. 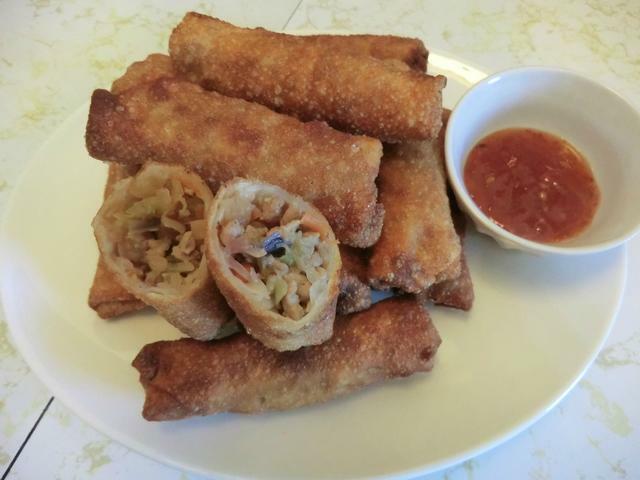 The savoury egg rolls were pretty amazing too. I used a jarred sweet Thai chili sauce but next time, the dip below is great too. 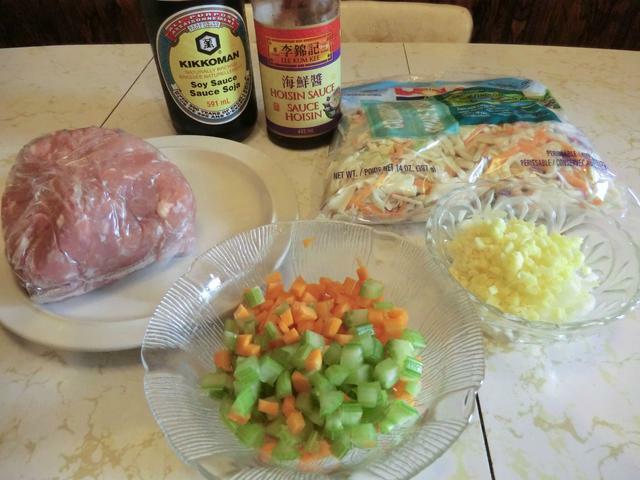 EDITED: Add 1-2 cups of bean sprouts to filling along with the coleslaw mixture. 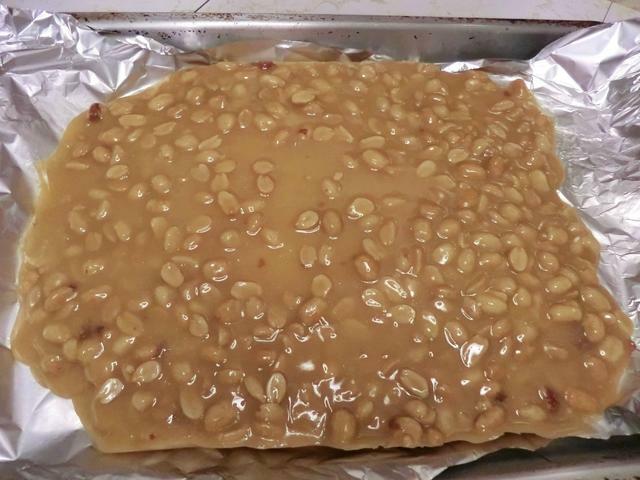 Prepare a baking sheet by covering with a couple of thicknesses of paper towel and setting a cooling rack on top. 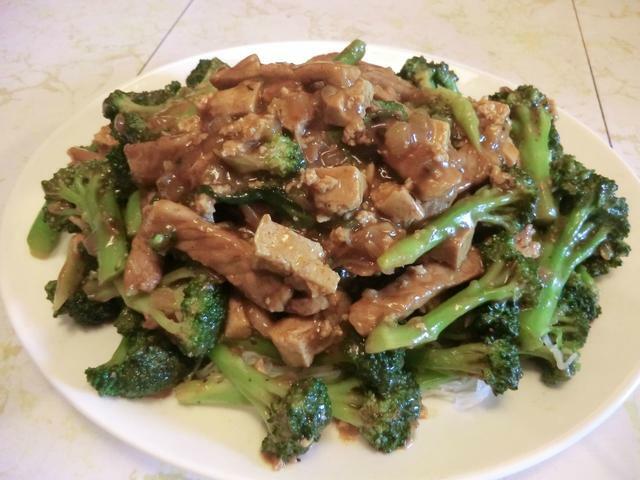 In a large saute pan, brown the meat in the vegetable oil. Add the 1/4 teaspoon salt. Remove the meat from the pan with a slotted spoon and set aside, leaving as much of the oil behind as possible. Add the diced onion, ginger and garlic and fry until the onion starts to get lightly browned. 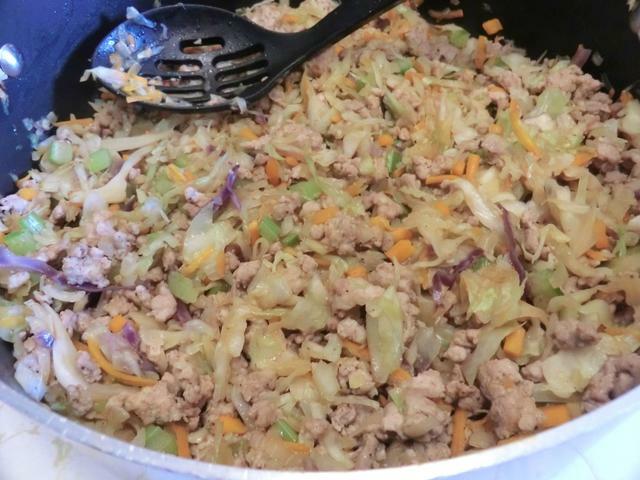 Add the cabbage mix, carrots and celery, mix and cover and cook until the cabbage is wilted and crisp-tender, 2-3 minutes. Add the seasoned cooked meat. 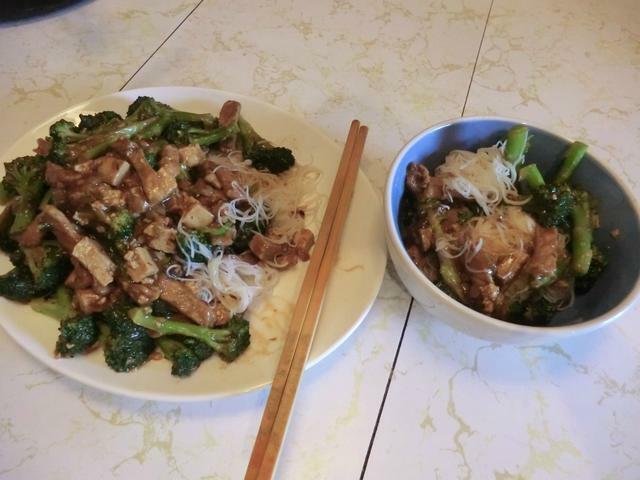 Stir in the hoisin sauce, soy sauce, and 1/2 teaspoon salt. Taste. If additional salt is needed, add another 1/4 tsp or so. Cool to room temperature before filling egg rolls. Drain off any excess liquid that may accumulate on the bottom. NOTE: You may refrigerate this mixture until the next day if you need to put off filling and frying the eggrolls. Otherwise, freeze the mixture and thaw in the refrigerator before using. 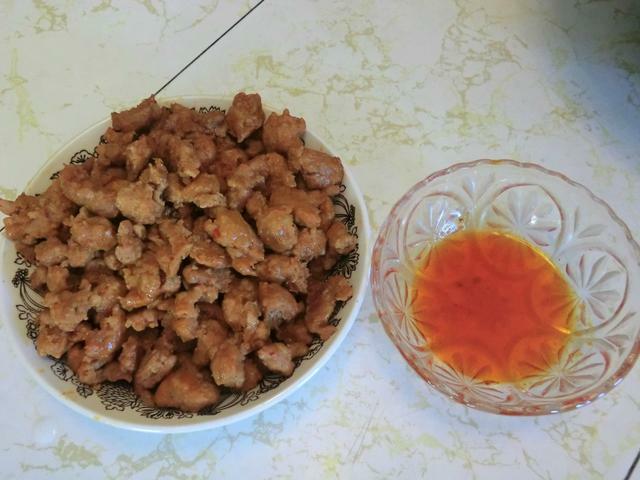 Prepare a deep fryer with oil, it should be about 2 inches deep and 350 to 375 degrees F. You can also shallow fry the egg rolls in a cast iron frying pan. I found that 1 inch of oil was plenty in that case. Since I couldn’t measure the temperature with my thermometer, I turned the temperature knob on my stove to medium (5) and preheated for at least 15 minutes so it would get to the correct temperature. I dropped a very small cube of bread into the oil and checked how quickly it began to brown … almost immediately, so I turned the heat down to 4. Make certain your oil is hot enough. Slow cooked egg rolls will be greasy. Lay a wrapper with the points of the wrapper facing you, like a diamond. 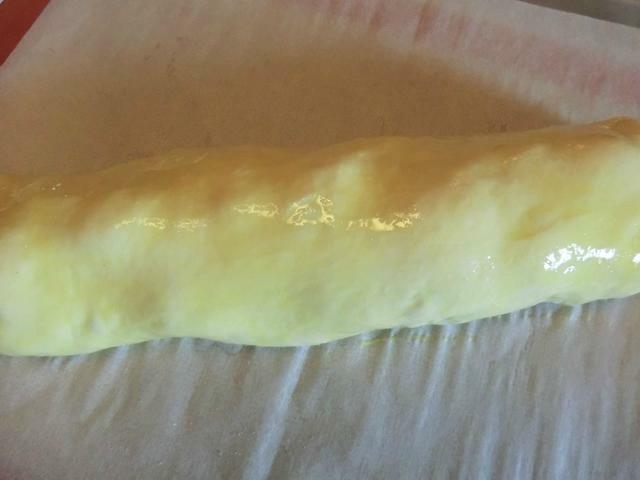 With a pastry brush, paint a thin strip of the egg wash around all four edges of the wrapper. Take a heaping tablespoon or two of the mixture and place it on the wrapper. 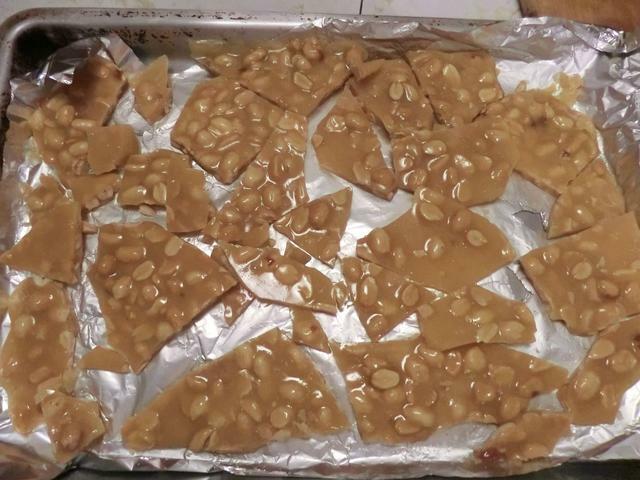 Fold over the bottom point of the wrapper, and tuck the mixture in, as tightly as you can manage, and continue to roll until you have a few inches of the wrapper exposed. 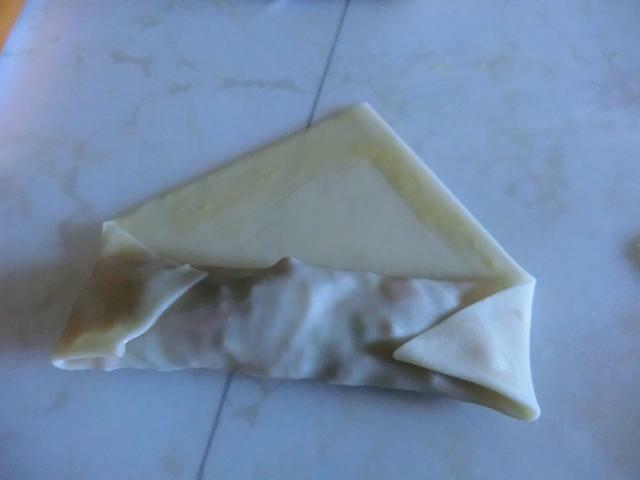 Fold over the two outside edges, and press down to seal in the filling. Continue rolling until the top point seals the roll. Repeat until all of the egg rolls are finished. 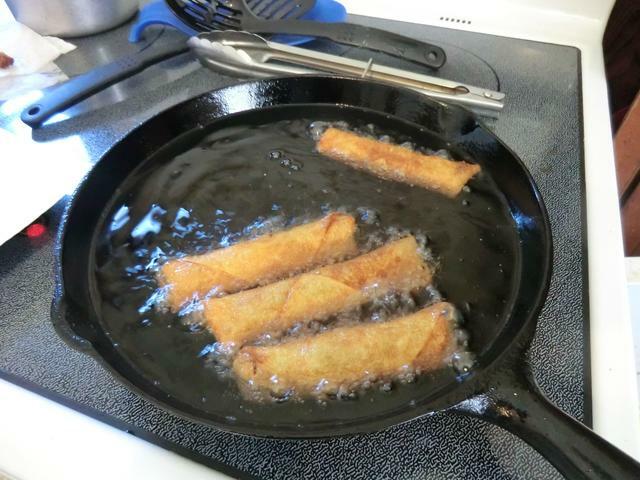 Carefully add about four or five of the egg rolls into your heated oil and fry for a couple of minutes, or until golden brown. Turn if frying in the pan to make sure the second side browns as well. 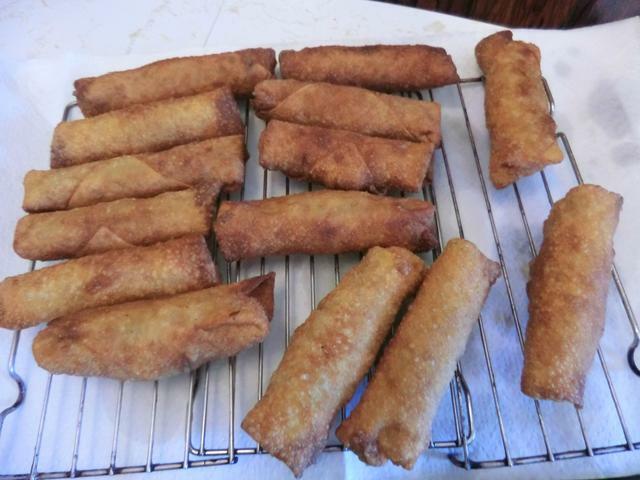 Remove the egg rolls with tongs, draining as much of the oil as possible, and allow to cool on the cooling rack. Repeat with the remaining egg rolls. Serve with the dipping sauce below or any commercial sauces ie. 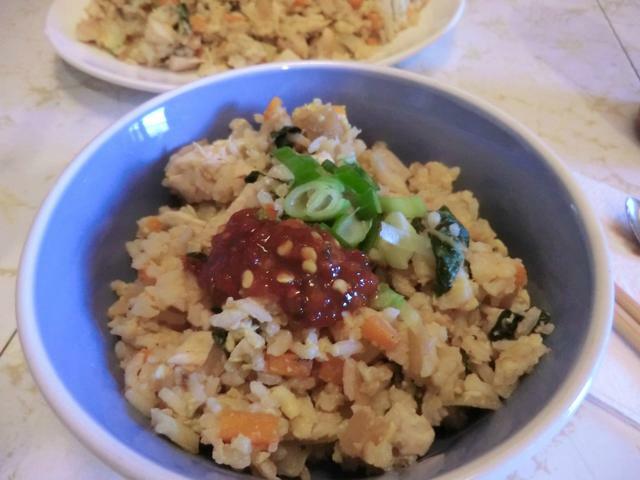 sweet Thai chili sauce, sweet and sour sauce or plum sauce. Yeast, glorious yeast … whether you buy it in a jar or paper packet or catch and raise it yourself. 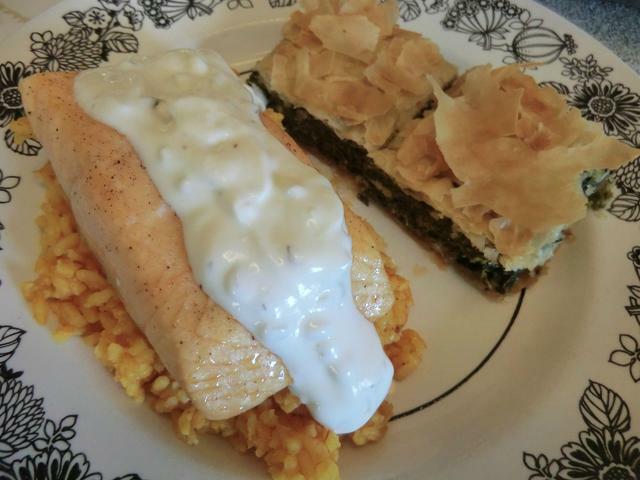 Both the two recipes below use it to make delicious bases for lots of future meals. 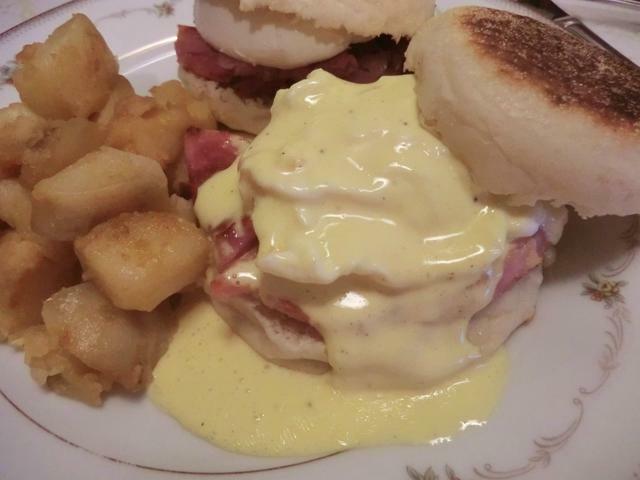 Like English Muffins for Eggs Benedict – The classic breakfast with an accompaniment of fried potatoes, cause there aren’t enough calories from the fried ham and a generous pour of Hollandaise sauce. In a small bowl, combine the sugar and 1/2 cup of warm water. Stir to dissolve the sugar and sprinkle the yeast on top. 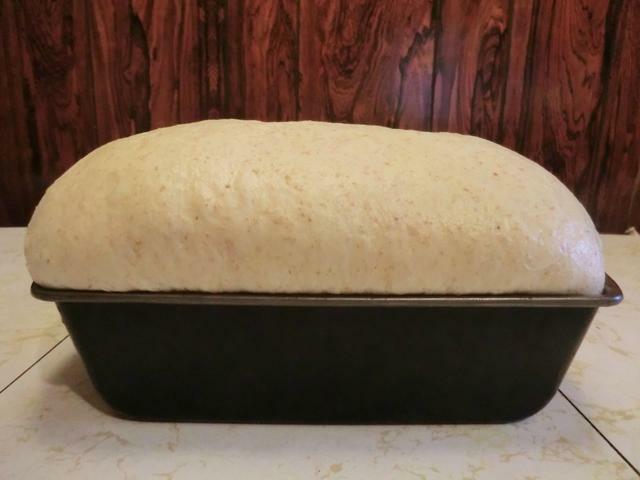 Let sit about 5 minutes or until the yeast is foamy. While the yeast/sugar mixture is rising, combine 1 1/2 cups of the flour and salt in a large bowl. Stir well to evenly distribute the salt. 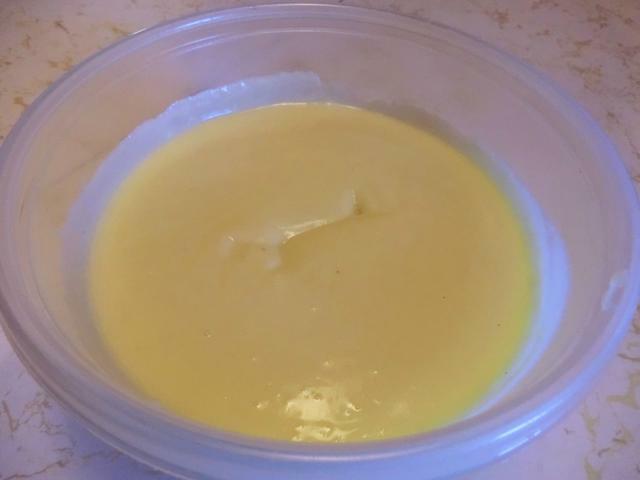 In a second small microwave safe bowl or your Pyrex measuring cup, combine the milk and butter. Microwave the milk/butter for 30 seconds, stir and microwave again for 30 seconds. Stir the butter until it melts into the warm milk. Sprinkle a little bit of flour onto a clean counter top or work surface and coat your hands in flour. Dump the soft ball of dough out of the bowl and knead it for about 5 minutes. Add as little flour as possible to the counter top while kneading. Adding too much flour will yield tough muffins. 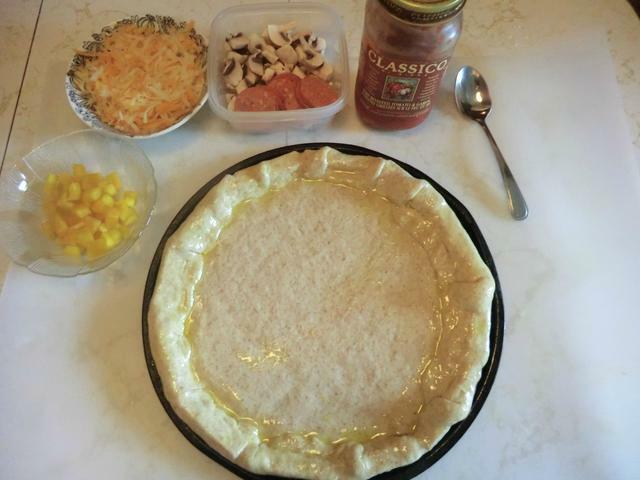 Shape the dough into a ball and place it in a bowl that has been coated in vegetable oil or non-stick spray. 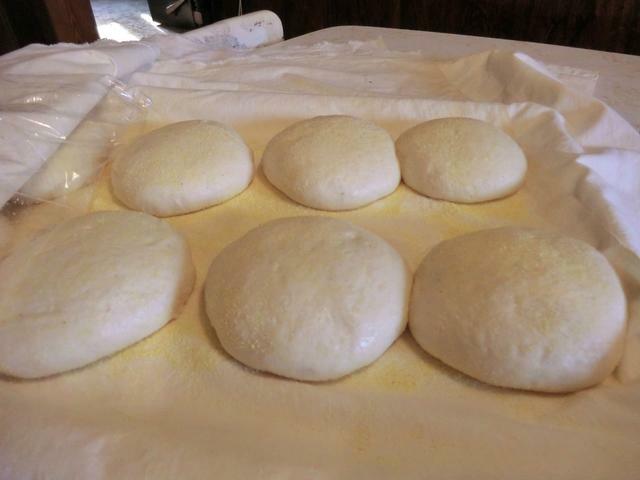 Lightly coat the top of the ball of dough with oil or spray and cover with plastic wrap. 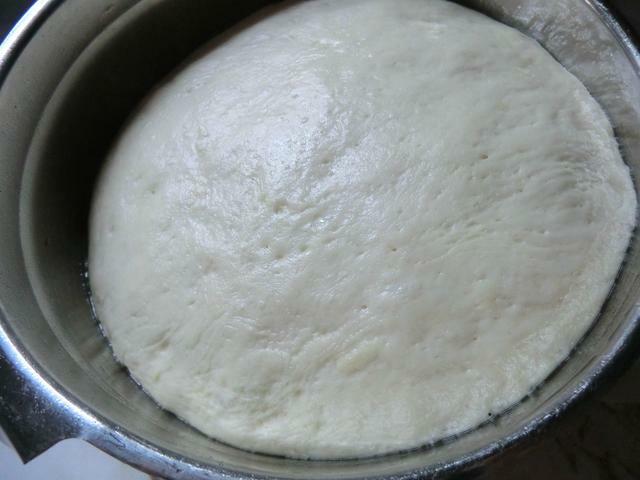 Let the dough rise until double in size (about 45 min – 1 hr). 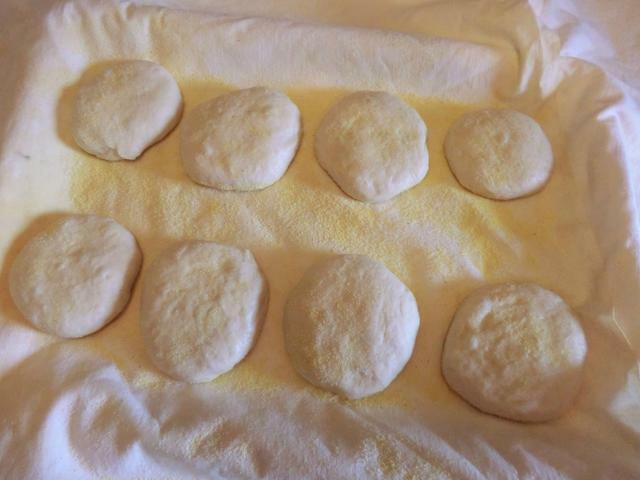 Turn the dough out onto a very lightly floured surface, cut into 8 equal pieces, form into balls, place on a linen sheet sprinkled with cornmeal, pat down lightly to about 3/4 inch thick. Sprinkle the top with more cornmeal and let rise, covered with a towel or oiled plastic wrap for another 45 min. Heat a large skillet or cast iron frying pan over medium-low (2-3) heat. Rub lightly with a paper towel dipped in vegetable oil or spray with non-stick spray. 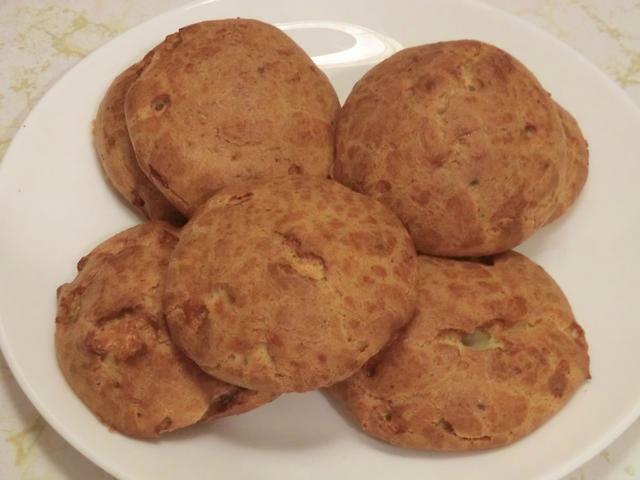 The original recipe cooked the muffins for about 7 minutes on each side but this will vary from stove top to stove top. 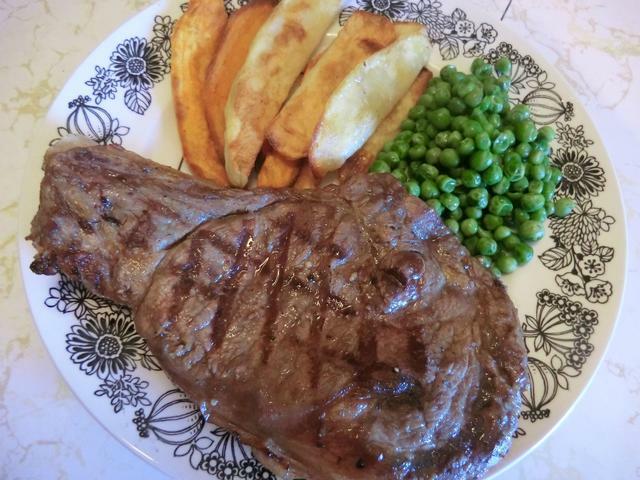 ALTERNATIVELY: I cooked them for 2 min on each side in the frying pan, then finished them in a pre-heated 350 deg Fahrenheit oven for 5-7* minutes. 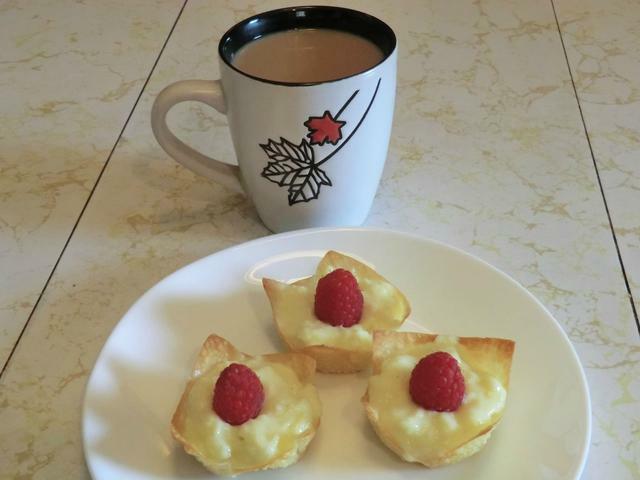 Let the muffins cool on a wire rack before attempting to fork split or slice open with a serrated knife. Toast and serve with butter, jam or fruit preserves. 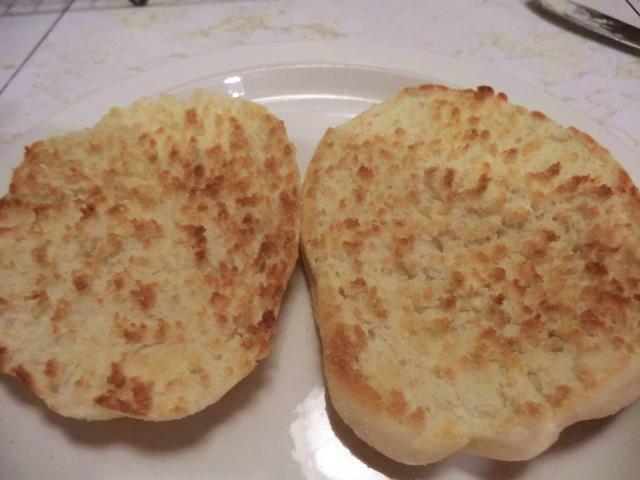 Fork split and toasted versus sliced and toasted. It’s your choice. 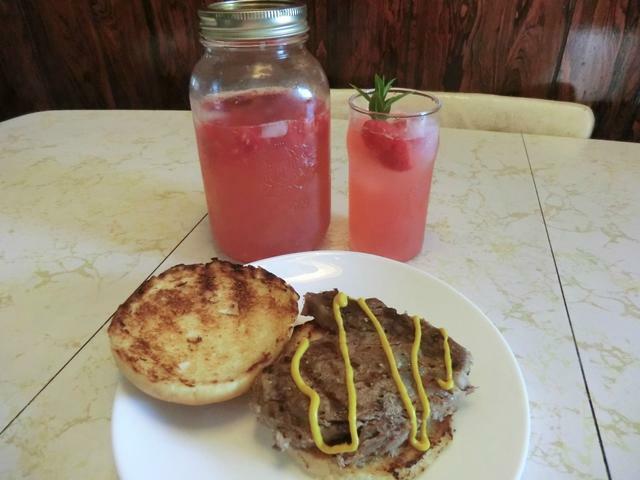 Or a bun for that classic of barbecue season … the hamburger. Or, if you’re in a higher tax bracket, there’s always the steak sandwich. 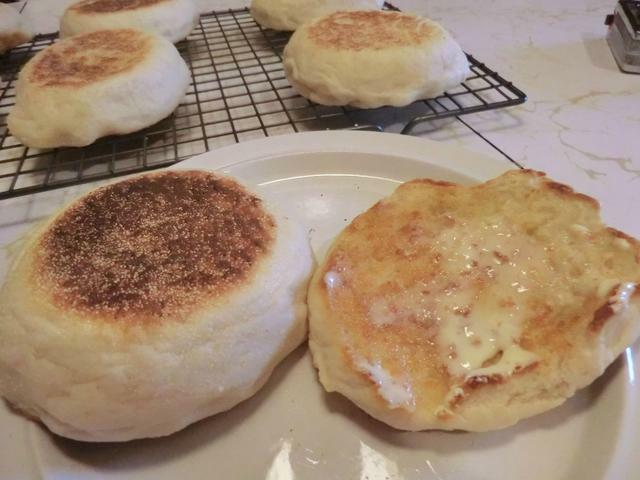 The original bun recipe included Parmesan cheese and garlic and onion powder but I went for a plain version. Feel free to try the other version and let me know what you think of it. I’ll stick with the plain … for now, at least. 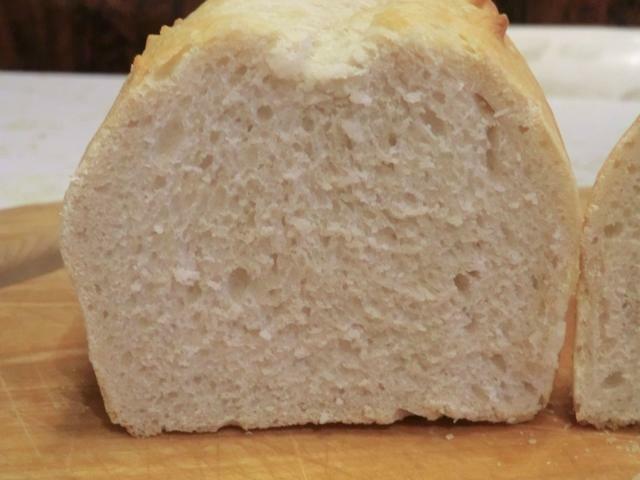 Note that this is a quick yeast bread so it uses more yeast than you’ll usually see in proportion to the flour and a lot of sugar to feed it … requiring no kneading and minimal rising/proofing time and giving you a sweeter tasting bun. 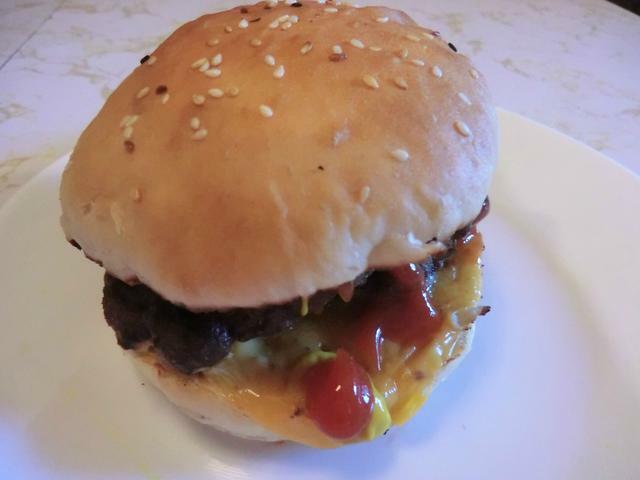 All of which make it very similar in texture and flavour to commercially purchased burger and hot dog buns. But they taste SO much better. 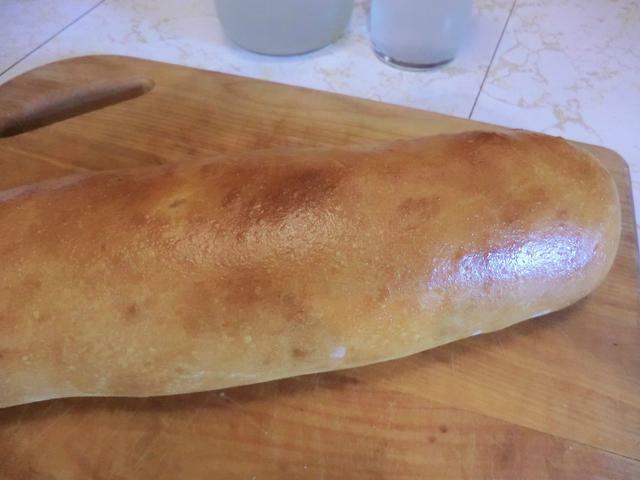 This is NOT a bread roll. 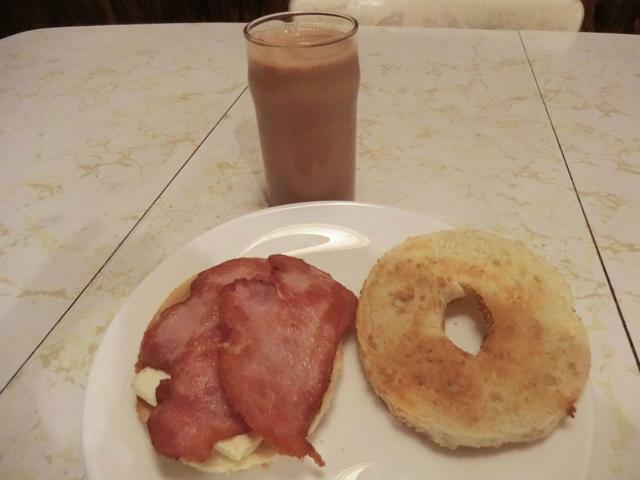 ** I didn’t have any whole milk so I used 1 cup plus 2 tbsp of 2 % milk. And I went with the melted butter. Combine the milk and water in a pyrex measuring cup and warm in the microwave to 100 degrees Fahrenheit. Stir in the sugar until it has dissolved and then stir in the yeast. 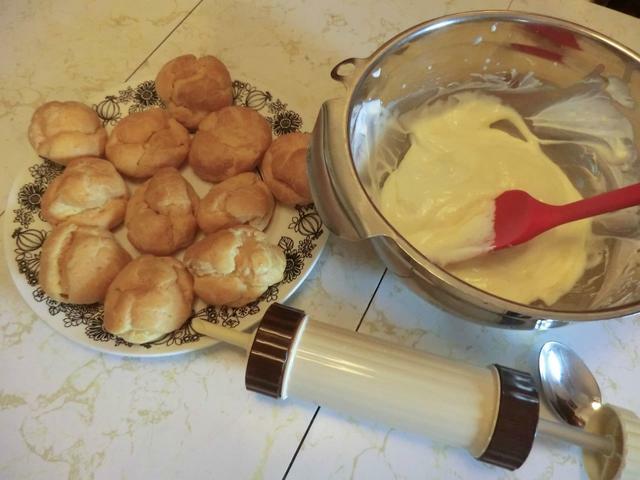 (Make sure the yeast is well mixed in or you may find hard lumps of yeast granules in your dough. ) Let sit for 5-10 minutes until the yeast is bubbly. 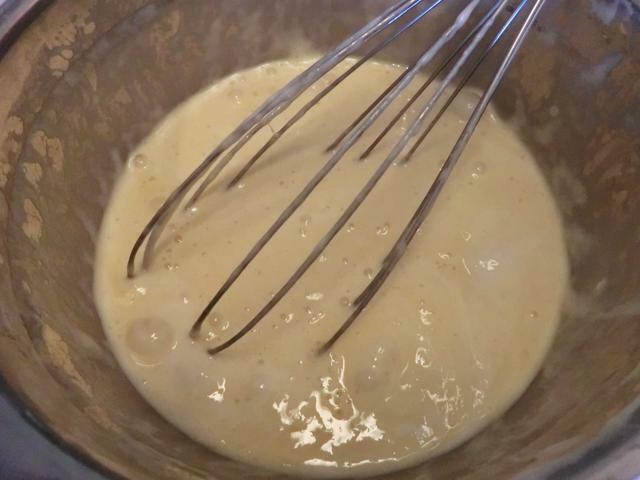 Add the proofed yeast, oil or melted butter and beaten egg and stir with a large wooden spoon until you’ve got a smooth batter. Add, the rest of the flour, 1/4 cup at a time, until you can no longer stir the batter and it starts to pull away from the edge, forming a ball. You want a soft but not sticky dough. Depending on the humidity you should have about 1/4 cup of flour left. 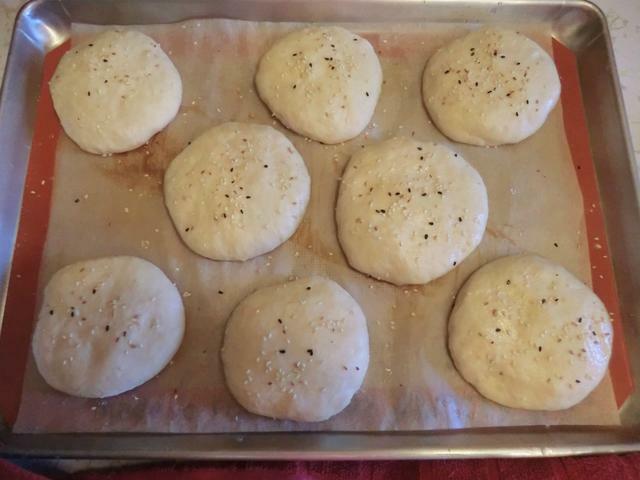 Shape the dough into 8 (or 12 balls), flatten so they’re about 4 inches in diameter and place into a lightly oiled 9 inch x 13 inch baking pan. For 12 buns you’ll need a second baking pan. If you have a half sheet pan, you can spread out 8 buns on it with a parchment paper on the bottom. You won’t need to oil the pan in that case. Cover the pan with a clean towel and let sit for 10-12 minutes. 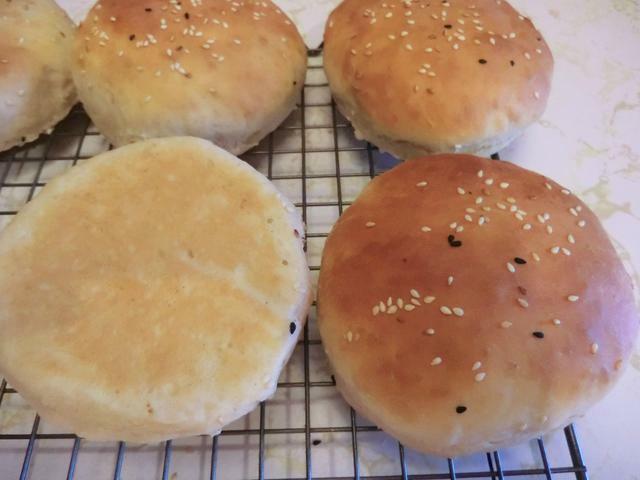 Sprinkle/mist water over the buns and then sprinkle some sesame or poppy seeds over the buns, if desired, as decoration. 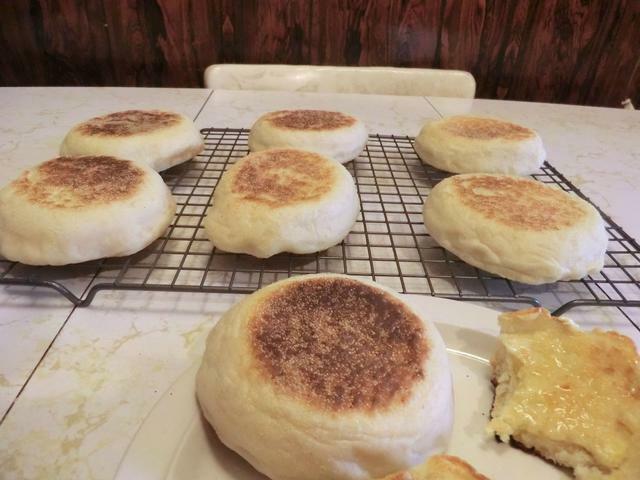 Bake the buns for 12-14 minutes or until the top and bottom are browned and a gentle tap on the bottom sounds dull. 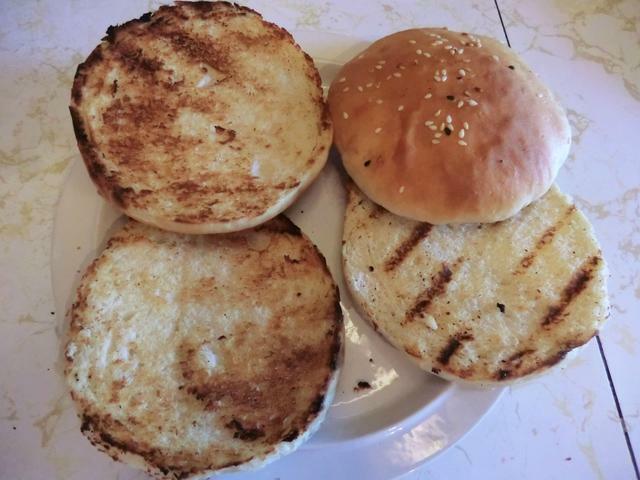 NOTE: For a glossy, brioche style look, instead of misting with water, brush the tops of the buns with the egg wash and sprinkle some sesame or poppy seeds over the buns. The buns in the picture above just had water brushed over them. 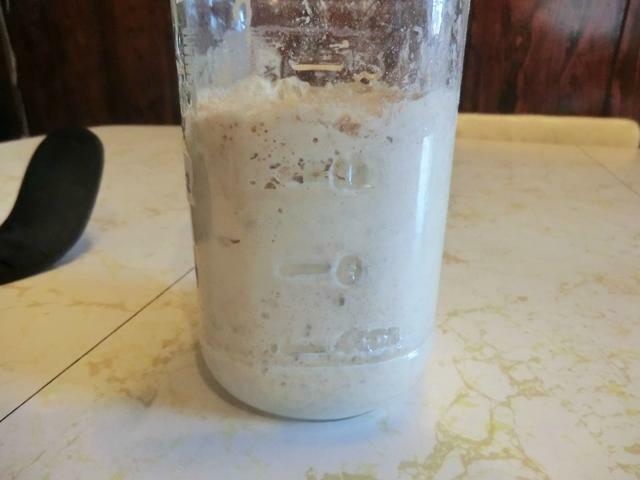 If you ever get the impulse to create a sourdough starter, you’ll periodically have starter to discard. That’s wasteful … but you can use this excess starter to make a batch of delicious pancakes. So get out your cast iron frying pan and get to it. 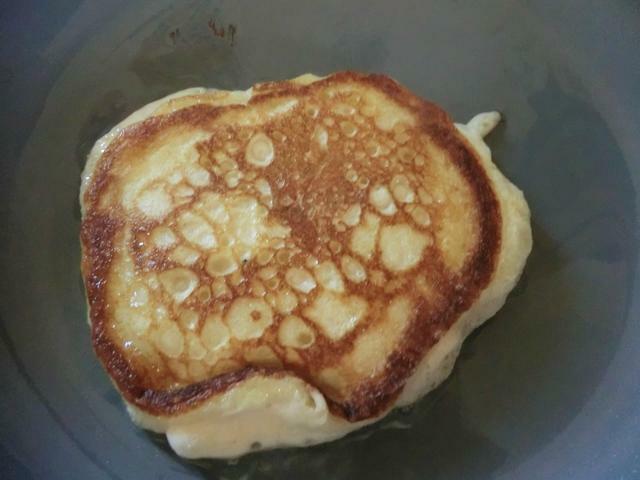 ** The original recipe used 1 1/2 tsp of baking soda but I found that gave the pancakes a bitter taste. In a very small bowl, measure out the baking soda and reserve. In a large mixing bowl, whisk together the eggs. Add the salt and sugar and beat until the sugar is dissolved. Add the sourdough starter to the egg mixture. 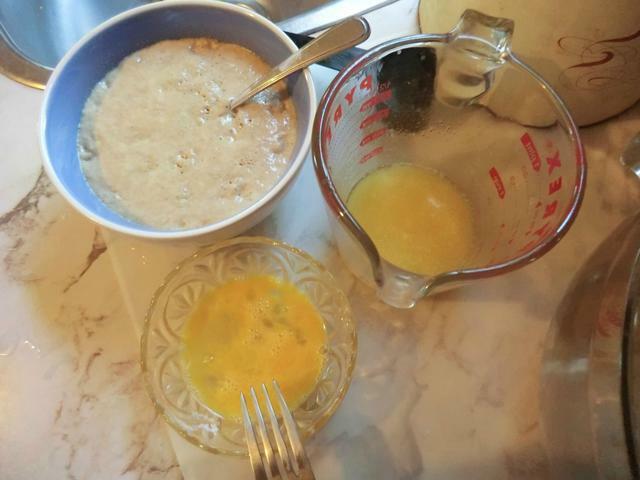 Add the water to the baking soda, mix well to dissolve and pour into the bowl with the egg and sourdough mixture. 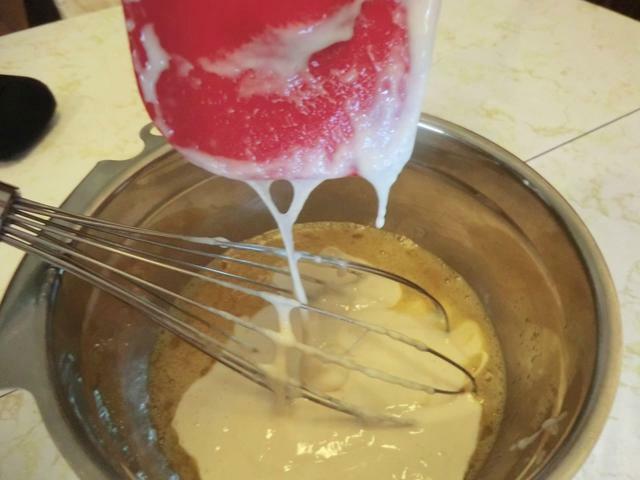 Beat quickly with a whisk until you get a homogeneous mixture. Do not whisk too long. 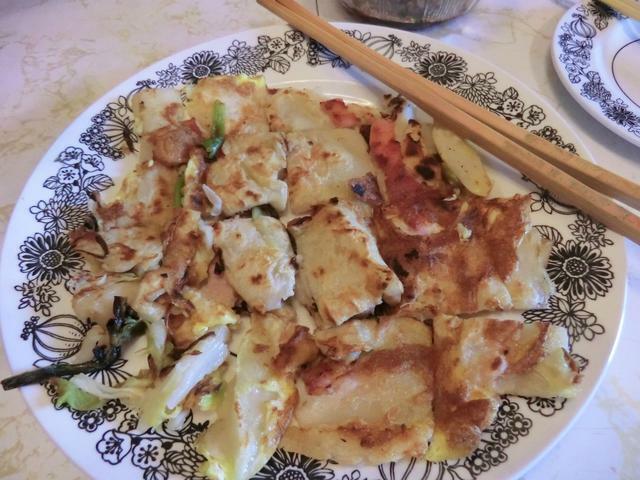 Preheat a griddle or non stick pan, lightly brushed with a paper towel dipped in vegetable oil, over medium heat. 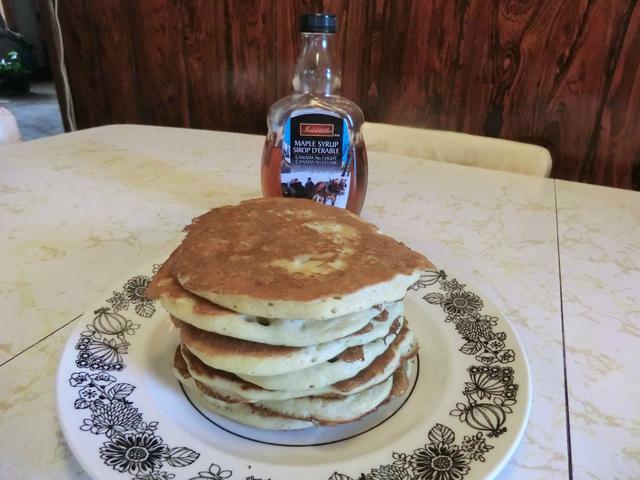 Spoon the batter onto the griddle in 1/4 cup amounts. 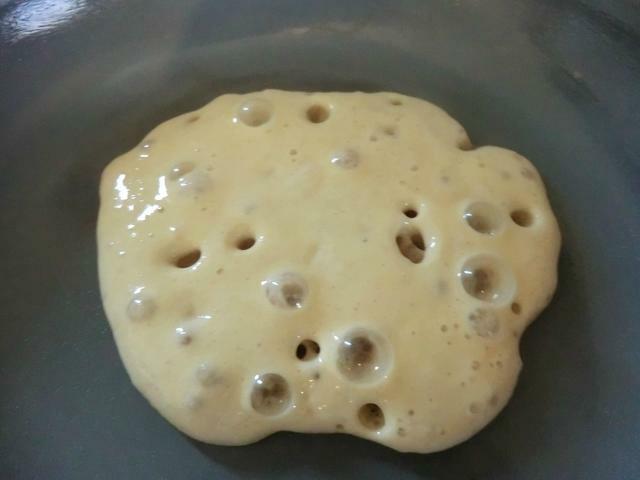 When bubbles appear on the top of pancakes, turn them over. 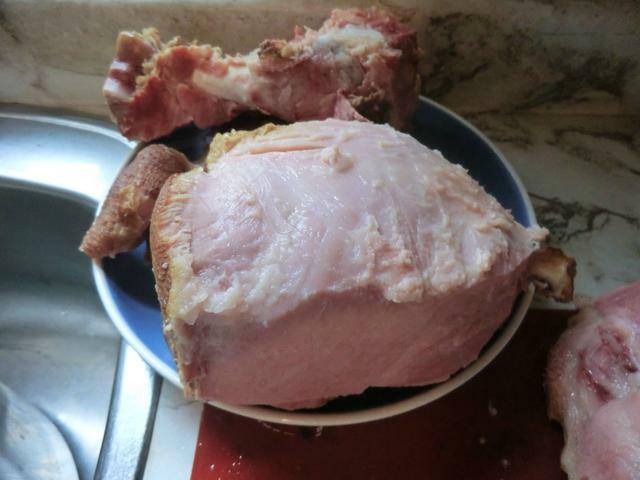 Cook until golden brown on the second side as well. Some more goodies I made near the end of the month. 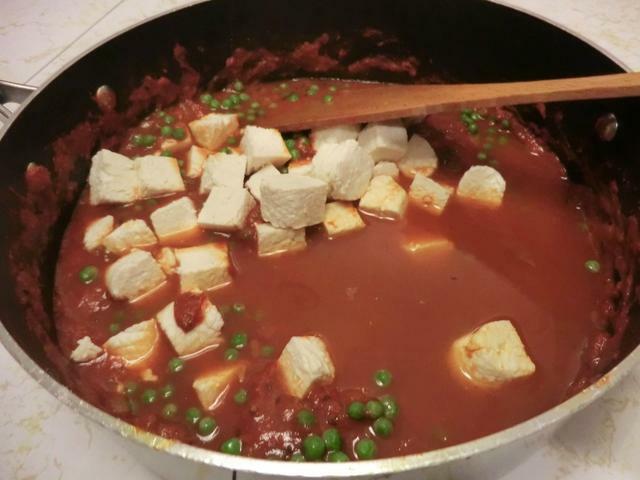 I tried a new matar paneer recipe and made 12 oz of fresh paneer to use in it. 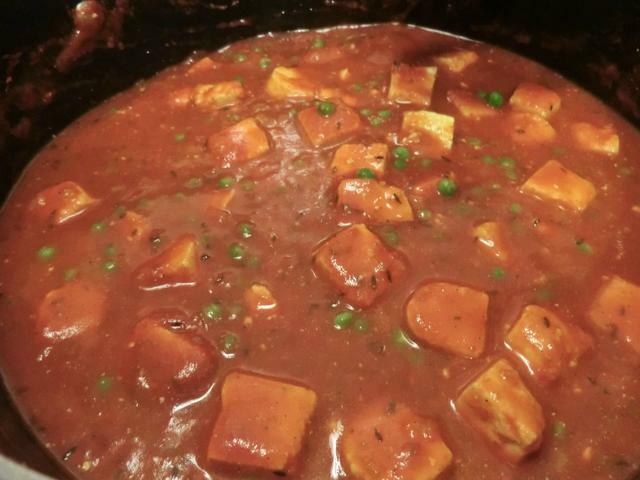 There was a lot of tomato gravy at the end, much more so than in the previous version I made. 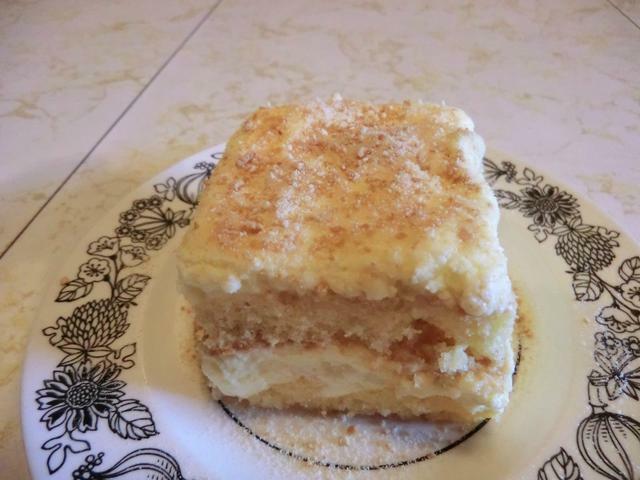 I added a bit of whipping cream to the sauce to sweeten it. 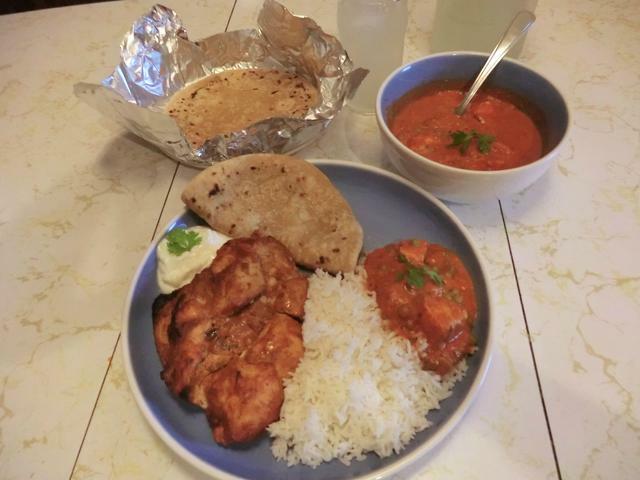 Indian Meal – purchased roti, chicken tikka, yogurt, basmati rice and matar paneer. 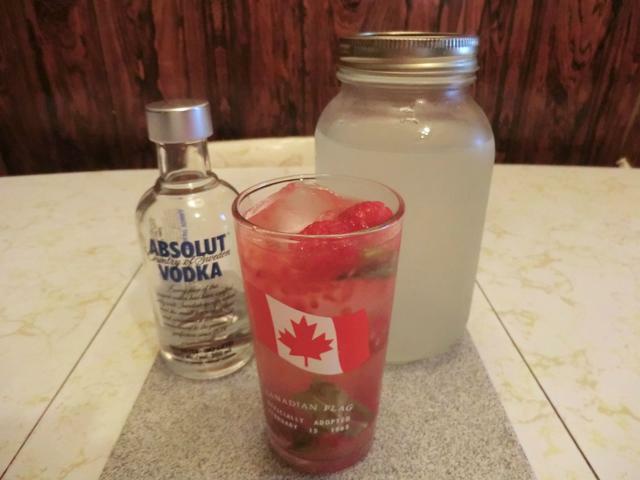 All served with some refreshing lemonade. 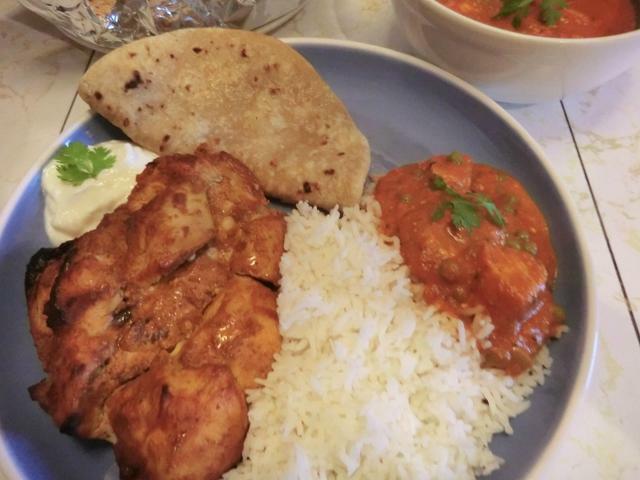 I made some pretty tasty Indian rice pudding with the leftover basmati rice (the next day, Sept 1, but I’m including it in this post). Take the saucepan off the heat and let sit for at least 10 minutes during which time it will thicken a bit more. 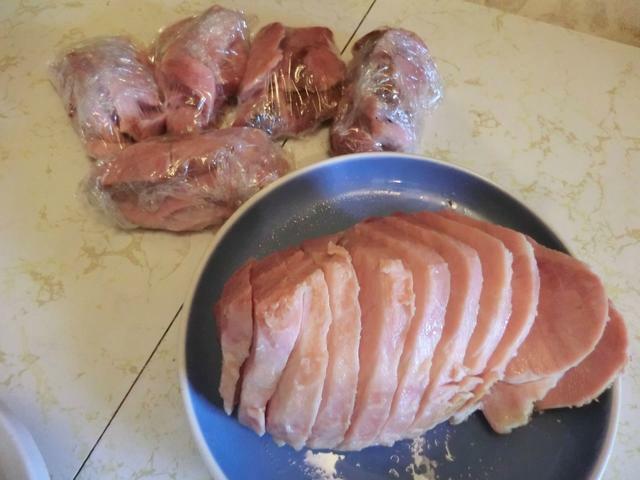 Ham … boiled and prepped for the freezer. I hope to do something creative with the pork skin eventually. 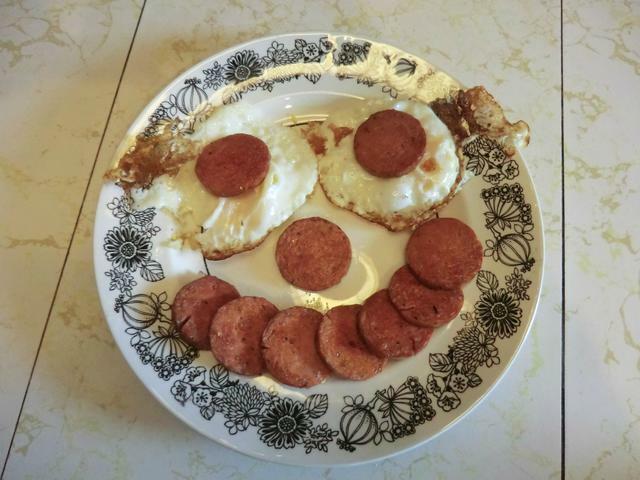 Close-up of the fried eggs and ham. You can always eat it directly out of the ramekin, of course. 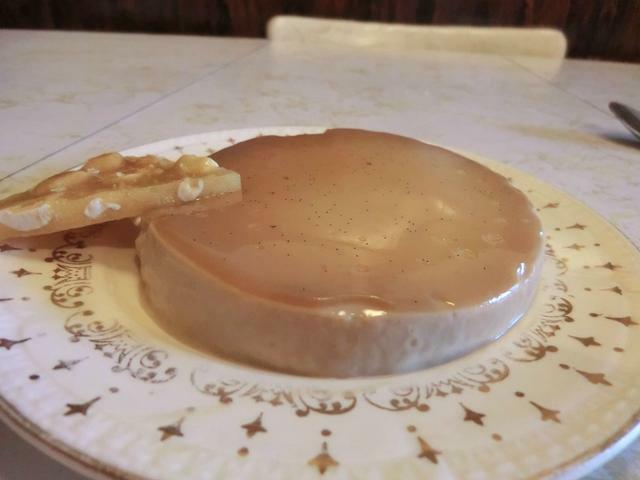 NOTE: I found even MORE pictures of things I made in August so there will be an August Round-Up – Part 3. 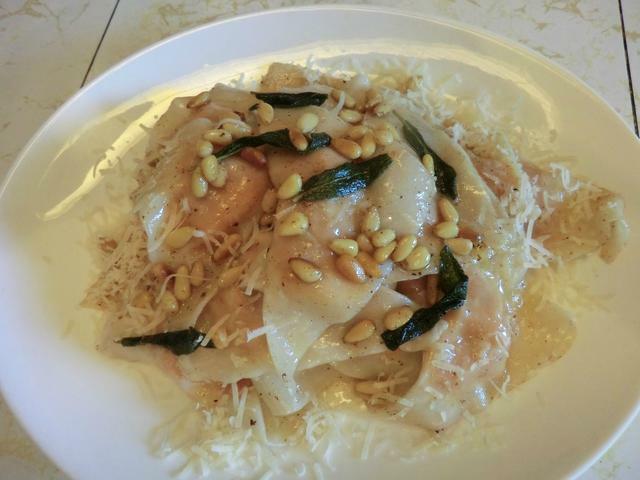 I also want to share the sweet potato and pine nut wonton ravioli with sage/brown butter sauce recipe and its mushroom variation … if only for my own records. 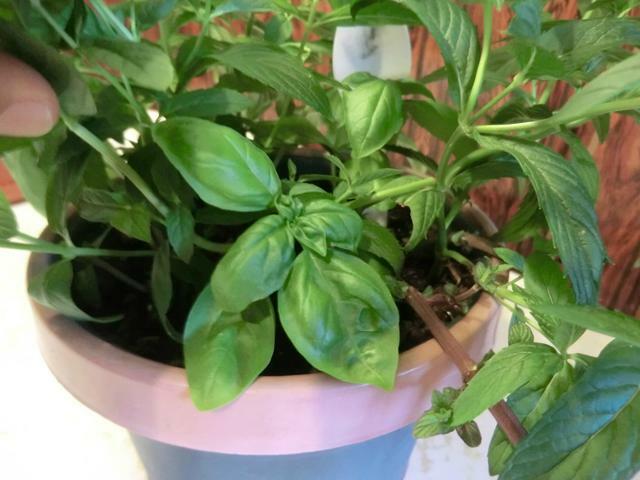 Only 4 of my basil seedlings survived the ‘damping off’ so I transplanted them into a big pot with some mint, that I had rooted from cuttings, and put them outside on my porch. Unfortunately the mint took over the pot. 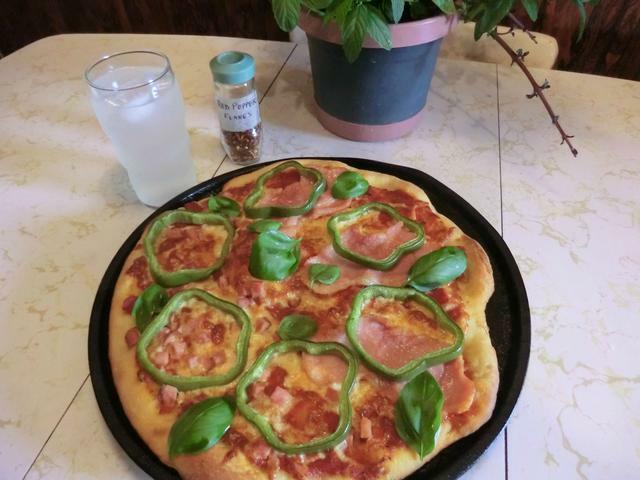 I grabbed some of the bigger leaves for the pizza below. 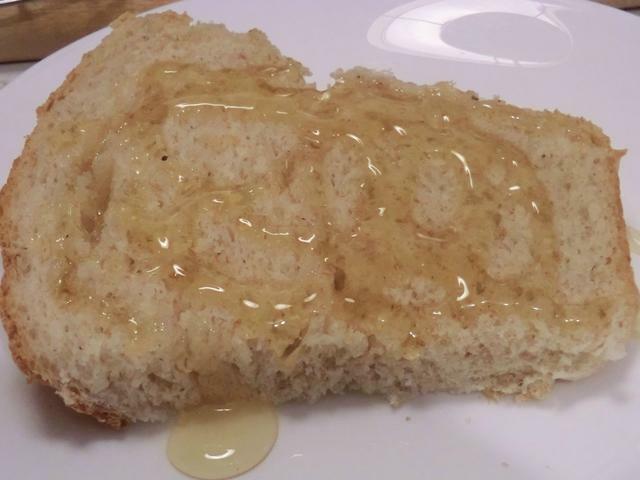 Honey Whole Wheat Bread – 20% whole wheat to 80% all purpose flour, the lighter of the 2 recipes I tried. Next time, I make buns. 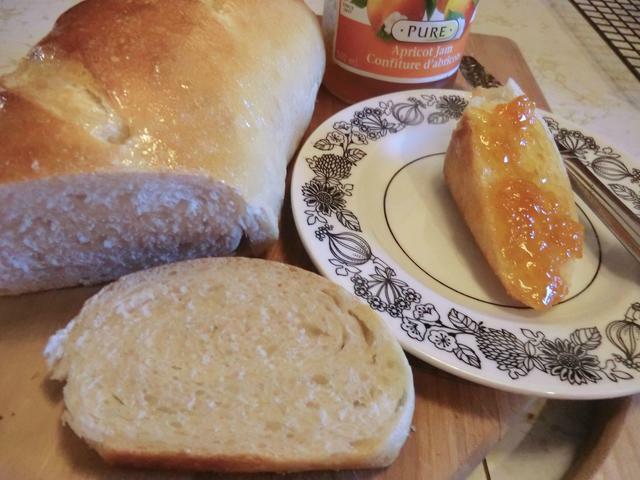 The sliced bread was great with butter or, more honey. 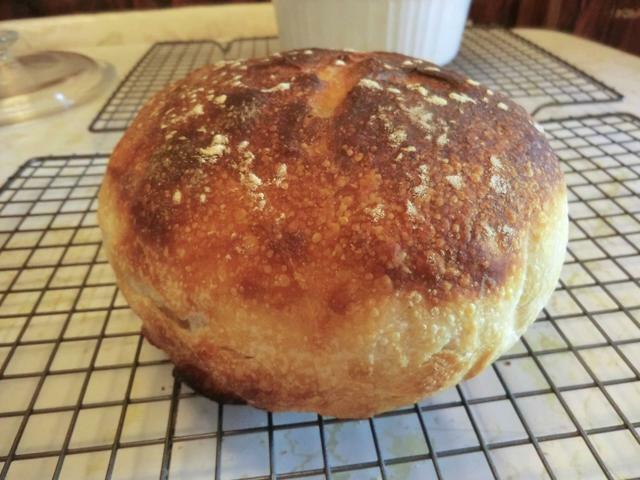 I did quite a bit of playing around with sourdough for about 6 weeks. 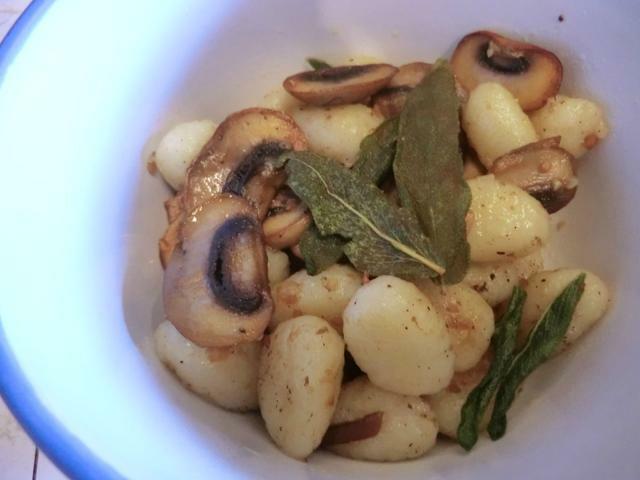 I didn’t take as good notes as I should have, but I took lots of pictures and may get around to writing up a real recipe at some point. Maybe NEXT summer. 2. More sourdough experimentation … overnight autolyse at room temperature and 4 and 6 hr proofing. 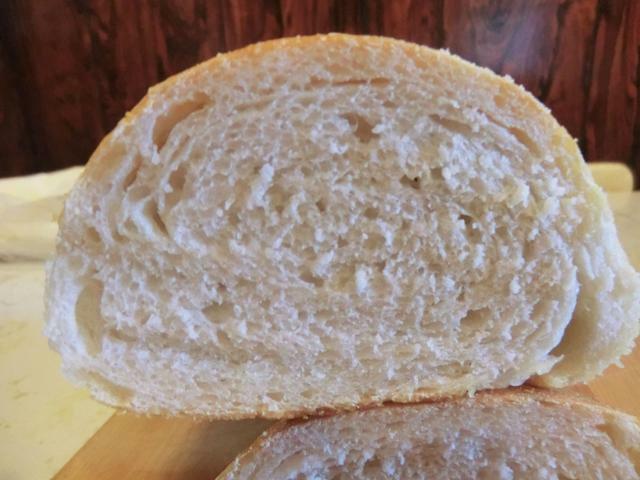 Over-proofing gives you a very pale loaf as the yeast eat all the sugar produced from digesting the starch and whatever sugar you give them, leaving nothing left for caramelizing during baking. 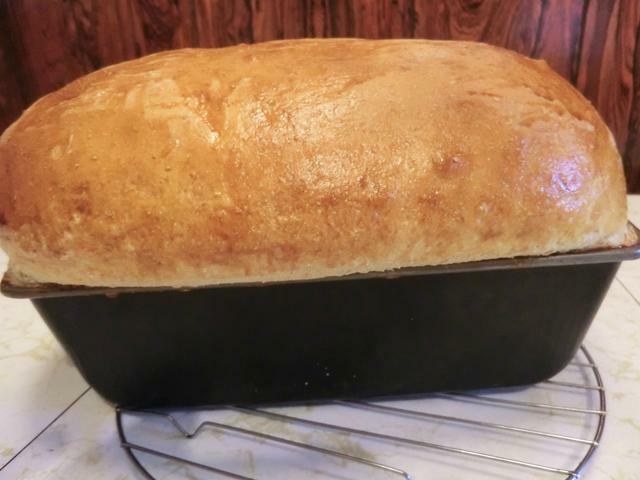 An egg wash, or melted butter glaze helps to give you a darker more attractive loaf. 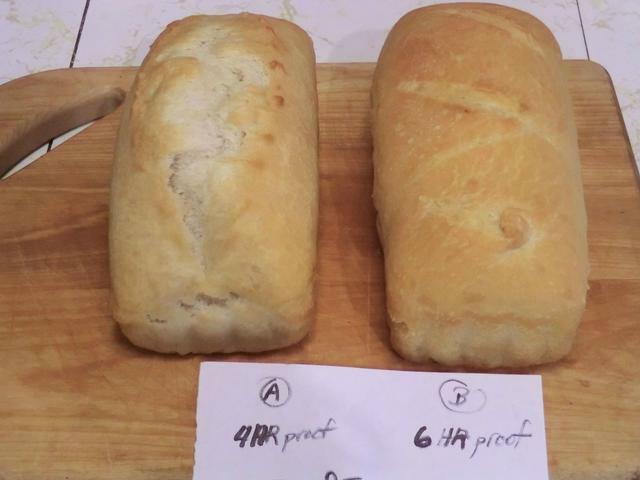 The inside of the loaves which had been proofed for 4 and 6 hrs, respectively, before baking. NOTE: I combined the rest of the blue cheese I had with Kraft ranch dressing for the dip here. 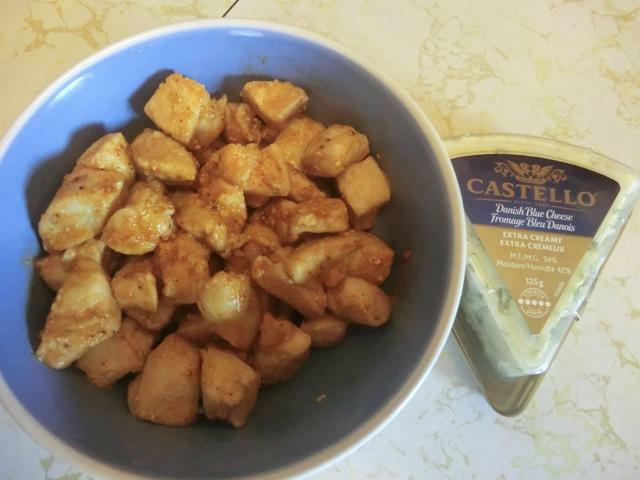 Place the chicken cubes in a small dish and sprinkle salt, pepper and garlic powder over them. Mix well. 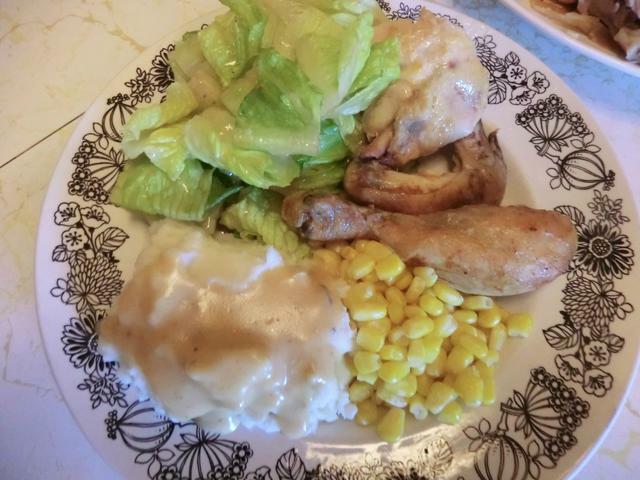 In a large saute pan over medium heat, melt the butter and saute the seasoned chicken until cooked through and lightly browned. Add the hot sauce and vinegar, stir through and taste. Let cool. 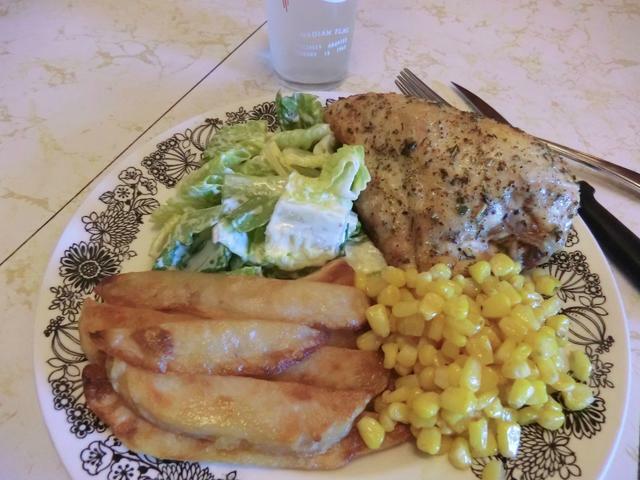 Prepare a baking sheet with a sheet of parchment paper or sprinkle corn meal across the surface. 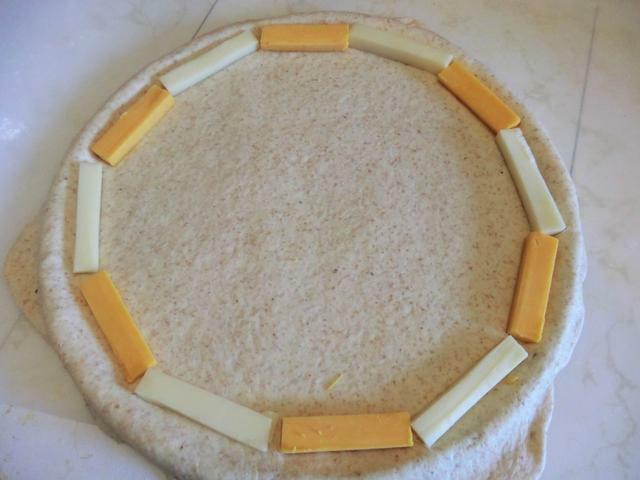 Roll out the pizza dough into a 10 by 14 inch rectangle. 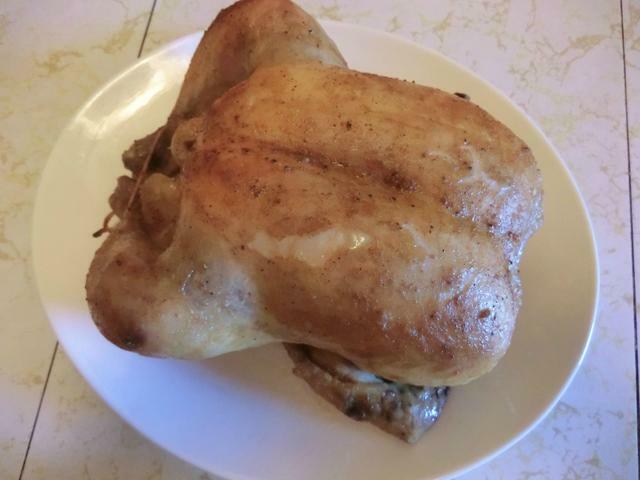 Lay cooled chicken along the long side. Sprinkle blue cheese evenly over the top of the chicken. Roll up tightly. Pinch the seam well and lay the roll of dough on the baking sheet, seam side down. Pinch side seams closed and fold under the roll. 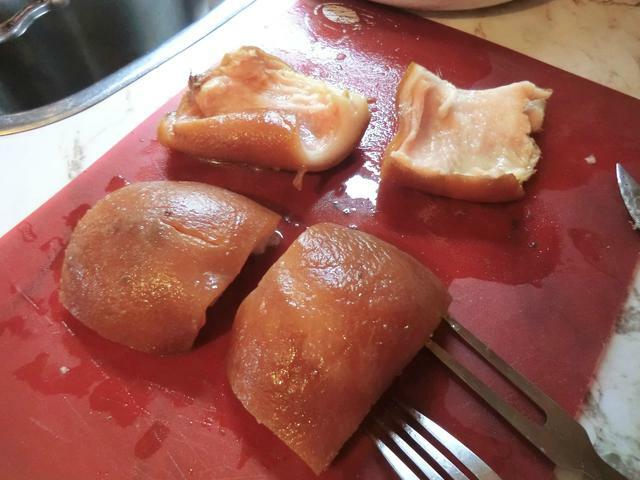 Brush an egg glaze of 1 egg yolk beaten with 1 tbsp of cold water over the loaf. 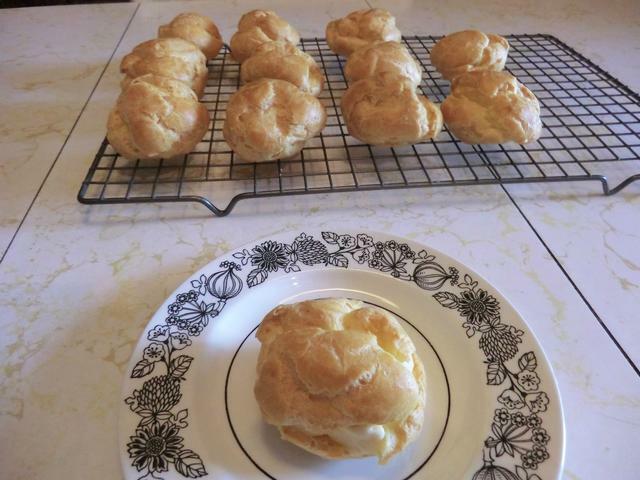 Bake for 35-45 minutes or until the pastry is golden brown on the top and bottom. 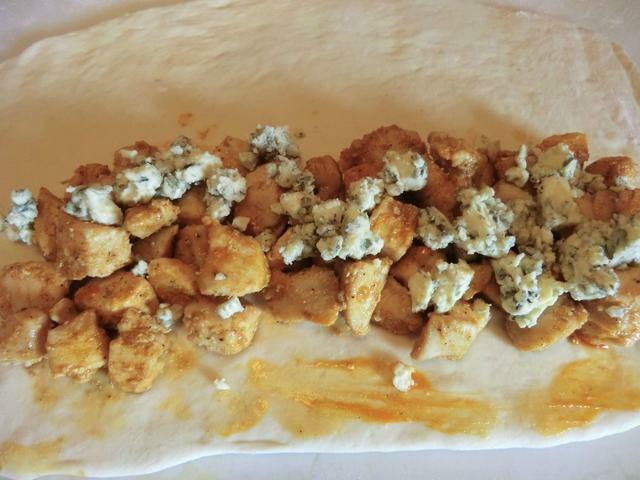 If the top gets browned too quickly, cover the stromboli with a sheet of aluminum foil. 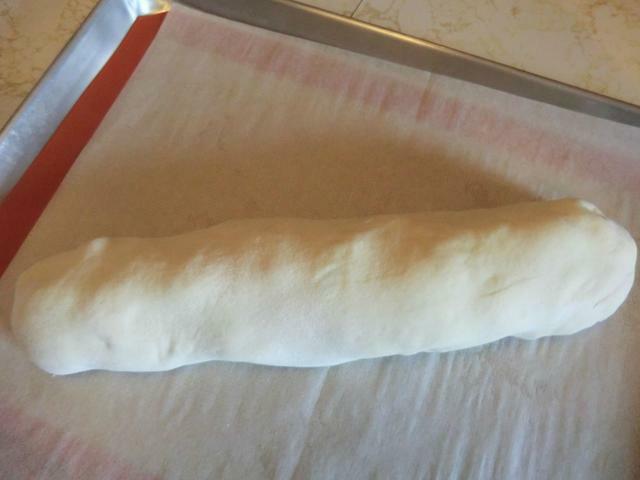 Let cool for at least 10 minutes and then cut the stromboli into one inch wide slices. 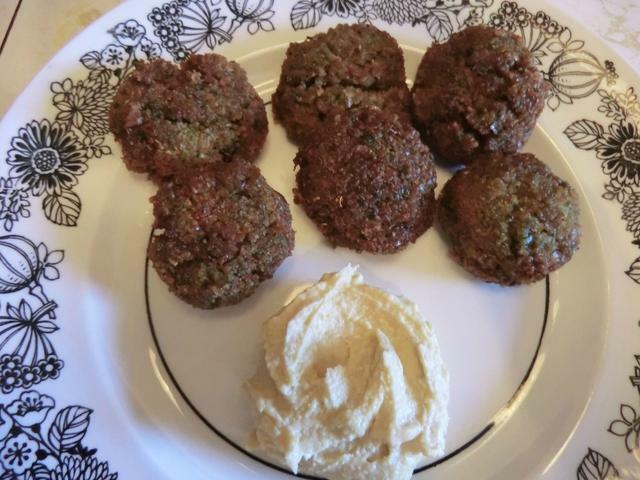 Serve with additional hot sauce and blue cheese dip and raw vegetables if desired. 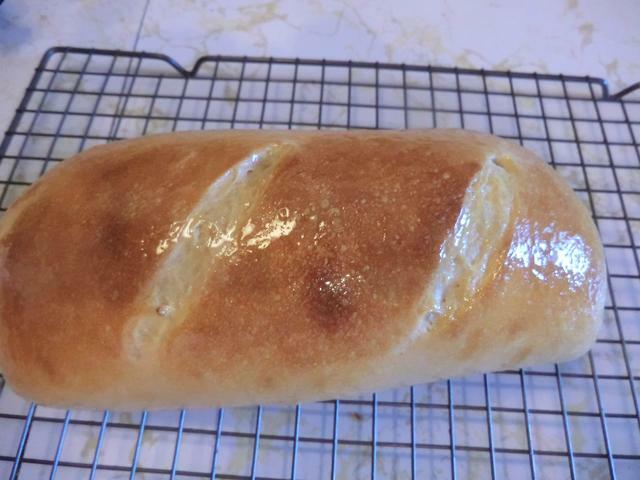 I did quite a bit of bread baking in August as well … 2 recipes of honey whole wheat bread and some more sourdough. 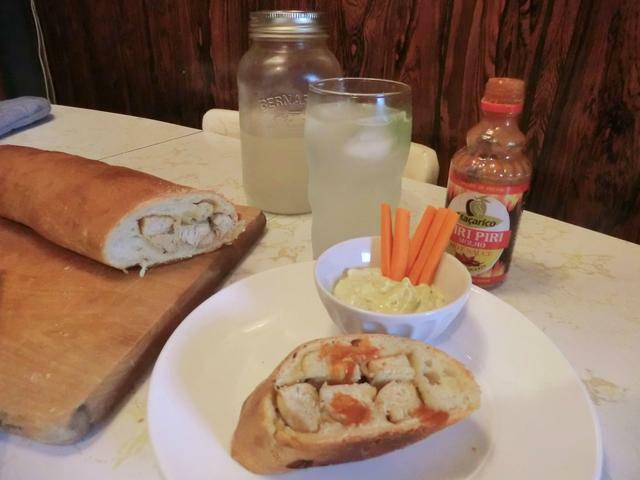 And there was some pizza and a stromboli. This time I’m going to show you the other stuff first. 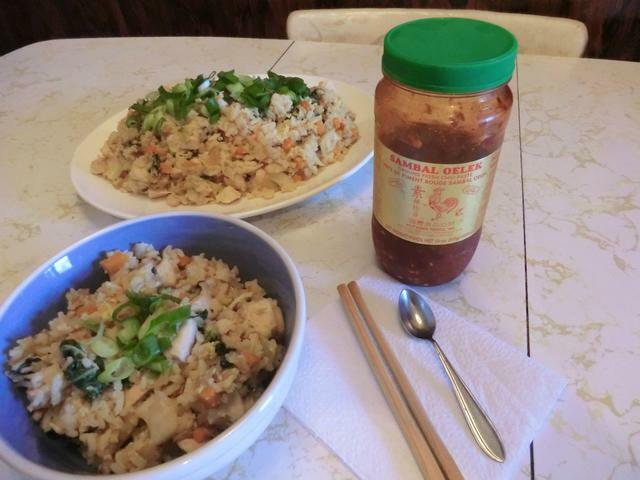 Chicken fried rice with meat from the roasted chicken. I’m still working on the fried rice part.